As time allows this week, I will answer these questions and just post them as they are completed (click links above for previous posts). Thank you so much for your warmwelcome home to our new life! The most significant of the sleep issues came at night. Once we moved to Warsaw, Elliott began having night terrors. If you have never experienced them, night terrors are similar to sleep walking in that the individual is completely asleep and totally unaware of what they are doing. They are different in the fact that they are HORRIBLE. Endless screaming, hysterical sobbing, violent thrashing. During a night terror, kids cannot be comforted because they are not even aware of your presence, and you are virtually powerless to help. They can last anywhere from a few minutes to an hour, and it is generally best to just wait it out, as being woken from it can be incredibly disorienting. But boy … does it take all the self-restraint in the world to just sit there watching your child like that. At their worst, Elliott had 3-4 night terrors a night, each lasting around an hour. He would scream until he was red all over and drenched in sweat, beat his head on the mattress, bite his own hands and arms until they bled. Especially at first, it was truly traumatizing. The greatest comfort was that we learned from our research that kids have no memory of the experience whatsoever, and we saw this play out in front of us. The night terrors always ended as suddenly as they started, with him either A) just rolling over and returning to peaceful sleep, or B) instantly sitting up, awake and grinning from ear to ear like normal. C.R.E.E.P.Y. The good INSANELY AMAZING, THANK-YOU-GOD-FOR-YOUR-GIFT-OF-SLEEP news is that the sleep issues virtually vanished when we got home. I was fully expecting him to go into Total Meltdown Mode with this, the greatest environment change of all. But if anything, we both seemed to find our way back to our normal selves from the moment we stepped off that plane. 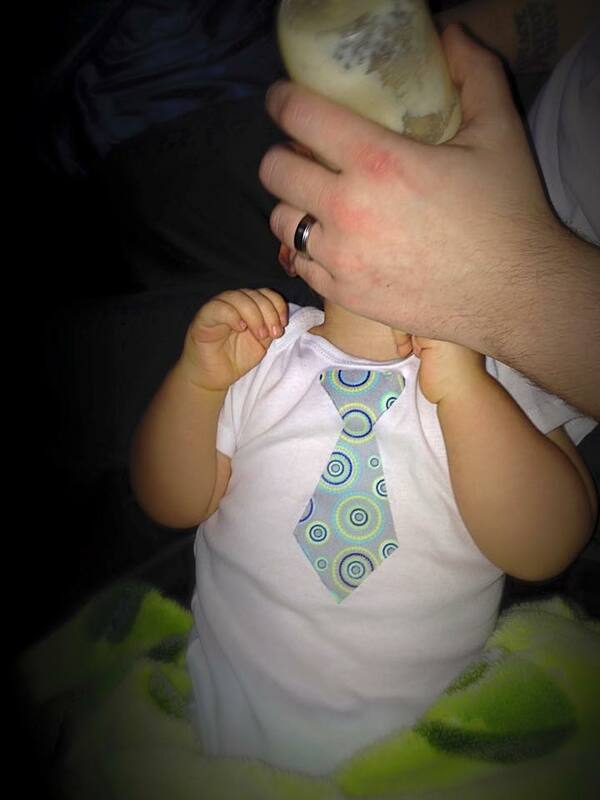 Now, I’m no doctor, but I’ll give you my theory: On top of his own stress, Elliott was feeding off of my stress. Those last couple weeks of being in Poland were the most stressful of my entire life. I wasn’t sleeping, was barely eating, and was a nervous wreck with handling Elliott’s issues alone on top of trying to get us through the complicated mess we were in regarding the never-ending logistical nightmares trying to prevent us from getting home. Seriously, I cannot even begin to put words to the overwhelming contrast of the peace of home. The second I relaxed, Elliott did too. Eating. For the most part, Elliott has always been a good eater. He is very open to new tastes and textures, and has few things he dislikes. Whenever we would go through a period of major change (moving apartments in Poland, Alex leaving, my sister arriving, etc. ), however, he would go through a period of eating less, eating at weird times, and extreme picky-ness, though this typically only lasted a few days. There are aspects of eating and drinking that are challenging for Elliott, mainly due to a type of cleft palette (which is not visible outwardly). This makes all but a couple liquids impossible for him to drink (he only drinks tomato juice and milk thickened with porridge) and causes him to choke easily. Because of this, his foster family erred on the side of caution, and spoon/hand-fed him everything, mainly in pureed form. After leaving the foster home, we allowed him to try feeding himself. Within days, he had it down. We also began trying more solid foods and progressed to drinking juice out of a bottle rather than having it spoon-fed. 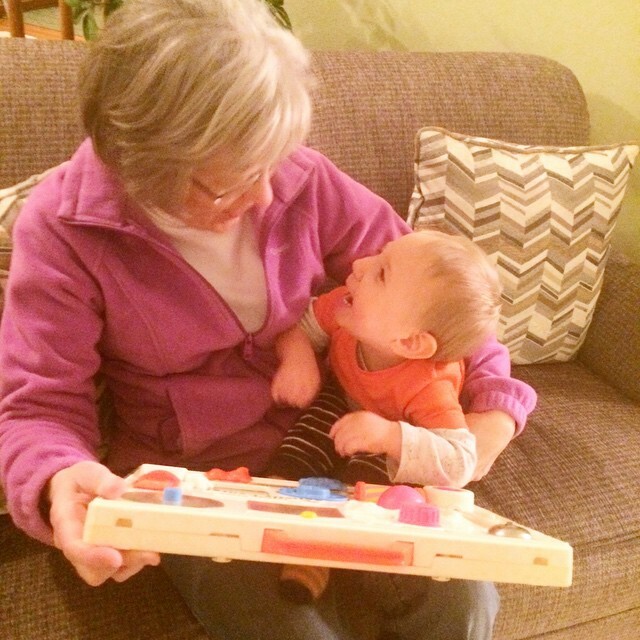 These have all been very positive steps, as he grew two inches in a month and made huge leaps in both hand-eye coordination and fine-motor skills. 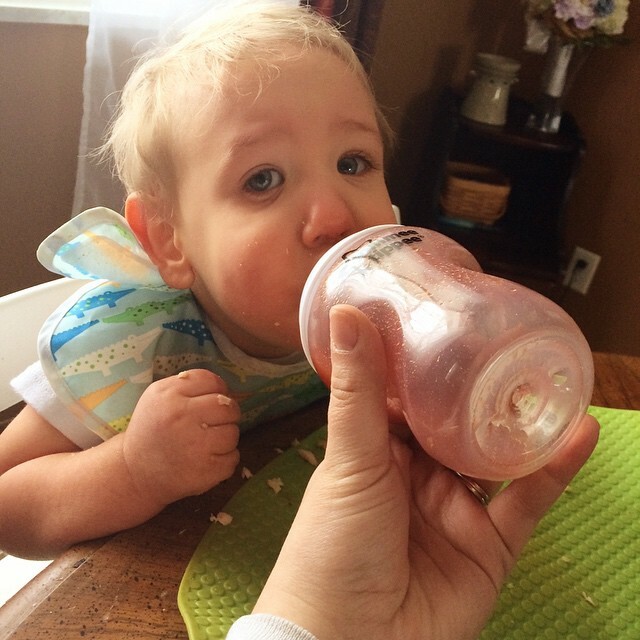 Now, he drinks tomato juice or V8 juice from a bottle with every meal and hand-feeds himself everything that he can. Socializing. This has been a particularly interesting aspect of Elliott’s adjustment, as he has slowly been exposed to new people. Elliott is extremely friendly and social, but has had very little interaction with other adults aside from his doctors and foster parents, nor with hardly any young children, as the kids in his foster home were all much older than him. So far, we have limited direct interactions with other kids only to children who will be a regular part of his life, such as cousins and a couple young kids in our weekly small group. The first time Elliott saw many young kids up close was during the period after Alex had left Poland and before my sister had arrived. We had visited an indoor playground for children under six, and it was full of kids running and yelling and climbing. Despite the room full of colorful toys, Elliott could hardly tear his eyes from the other children. And like little kids do, before long several had scampered up to Elliott and were reaching out to stroke his hair or squeeze his hands. At that point, Elliott decided his primary interest in other kids laid in watching them from a safe distance. He completely froze up, and clearly had no idea what he was supposed to do in response. Now that we are home, it has been especially entertaining to watch him interact with his cousins and new friends, as he moves from watching side-eyed from the safety of Mama’s shoulder, to venturing a tentative squawk in their direction, all the way to bravely reaching out to grab a nose or chin (next is working on appropriate/less painful ways to reach out to friends!). Similar to his interactions with kids, we have limited significant interactions with new adults to those who will play a significant role in his life, such as family members or close friends. Even these interactions can trigger negative reactions, however, but we’ll get into that more when we talk about attachment. America. On top of everything else, I have to remind myself that Elliott is adjusting to an entirely new culture and country. He spent his first 18 months in a quiet, country village full of wandering farm dogs and mistletoe-laced trees. Then, within two months, he lived smack-dab in the middle of two different major Polish cities. Now, after a long plane ride, he finds himself in the American suburbs, buried in snow. Each of these changes were major stressors for me, which effected many different aspects of my life until I adjusted – and I even had plenty of advanced notice on these moves! It is hard to fathom what they must have been like from Elliott’s perspective. If you have ever visited another country, you know that it is an entirely different sensory experience from the one you are used to. The sights, the smells, the tastes, that general “vibe” you get from your surroundings … all of it is new and different. Everything we have learned about international adoption tells us that even very young children are keenly aware of this shift in their surroundings. Food is a big part of this, and as much as we have done our best to incorporate foods that he is familiar with into his meals, there is no choice but for him to adjust to a new diet. Even the familiar foods we find can’t compare to their authentic Polish counterparts. Perhaps even more significantly, Elliott is also adjusting to a new language. Even though he says little, we know that he understood a pretty good amount of the Polish that was spoken to him in his foster home. 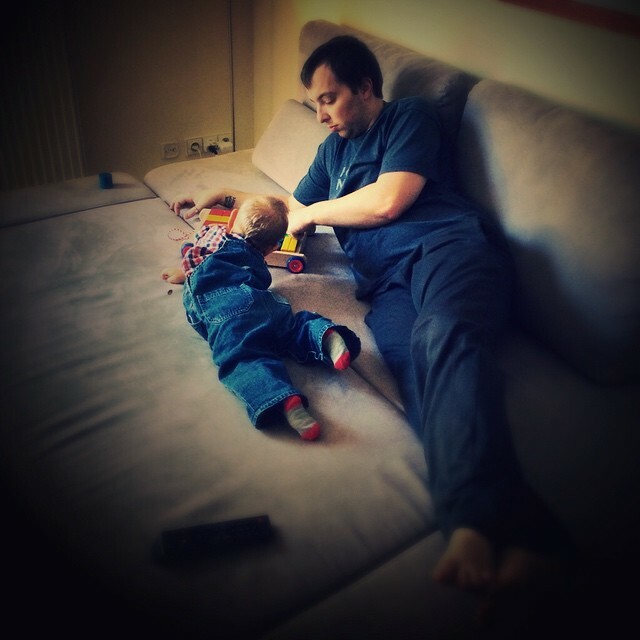 I have to continually remind myself that every single day, Elliott is exposed to hundreds of words that he has never encountered before – words that he would understand if I were speaking to him in Polish. Right now he speaks a handful of Polish and English words, but each day we can see that he understands a little bit more of the English he is now immersed in. When I think about it, I am amazed all that his little body has had to process, and just how well he is handling it all. Kids are remarkably resilient, and I am so proud of all our little dumpling has already overcome! As time allows this week, I will answer these questions and just post them as they are completed (click links above for previous posts). Thank you so much for your warm welcome home to our new life! I guess it makes the most sense to back up and talk about what it was like to be in Poland as a family of three, because we were a family for a couple months before actually making it home. It is truly hard to find the words to describe the experience of going from two to three with a little person who already has 18 months of life under his belt. 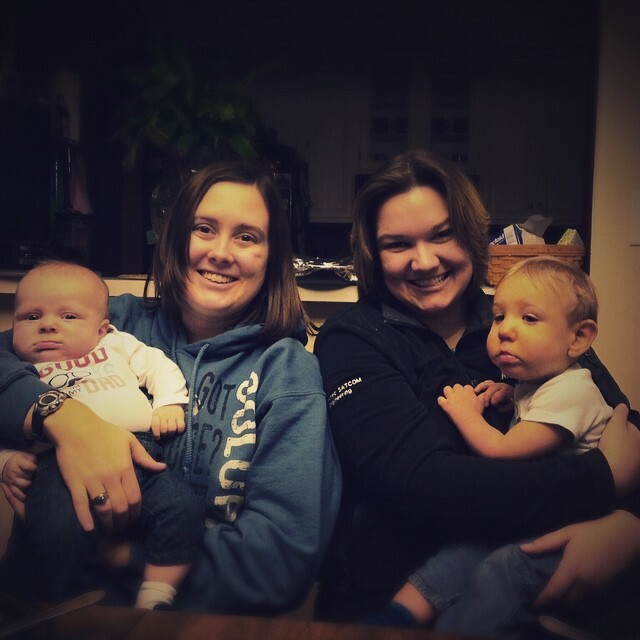 At first, it felt a little like playing house, or like we were the temporary babysitters and not this child’s parents. This was especially true when we were staying with the foster family, and I think continued to be in the back of our minds up until our adoption was finalized. I want to say up front that the process of bonding with an adoptive child, and vice versa, is a deeply complicated experience. We were fortunate enough to have this process happen under the most ideal circumstances imaginable, with a young child who was already healthily bonded to a caregiver (this is a very good thing!) who did all in her power to ease us all into the relationship. Because of this, our bonding process happened faster and smoother than we could have ever hoped. This is not to say that it didn’t have its difficult moments, but I believe we truly had an atypical experience due to the unique circumstances. I think the general perception of adoption (that has probably been fueled both by Hollywood and by a general lack of discussion on the topic) is that from the moment that child is placed in your arms, the rest is just happily ever after. In reality, this is never, ever, ever the case (even under ideal circumstances like ours). Many families, marriages, and individuals struggle immensely in the beginning of the post-adoption phase, but do so silently out of fear of causing friends and family to think the adoption was a bad idea or that they are unsatisfied with their new child, or out of fear of casting a negative light on adoption as a whole, etc. Because of this, “Post-Adoption Depression” is a very little known, but very real experience for many families. Now, don’t get me wrong. 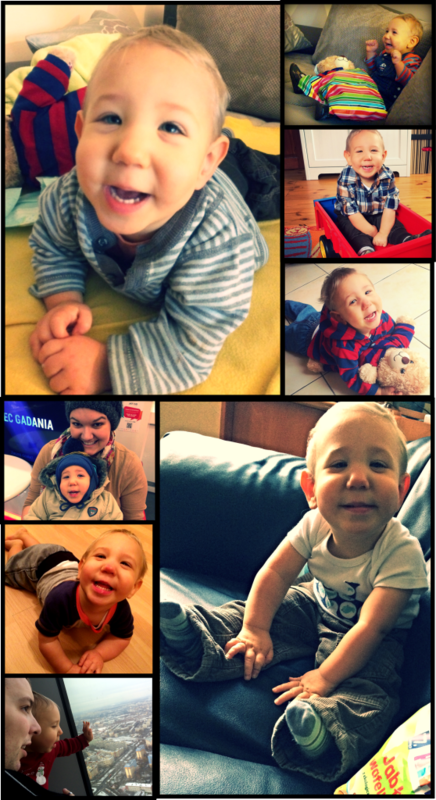 From the moment I laid eyes on my son, I loved him with a fierceness I didn’t know was possible. He was mine, and would do anything for him. I also want to ease any fears that Alex or I are suffering from Post-Adoption Depression or even anything in that ballpark – that is not why I bring up the topic. 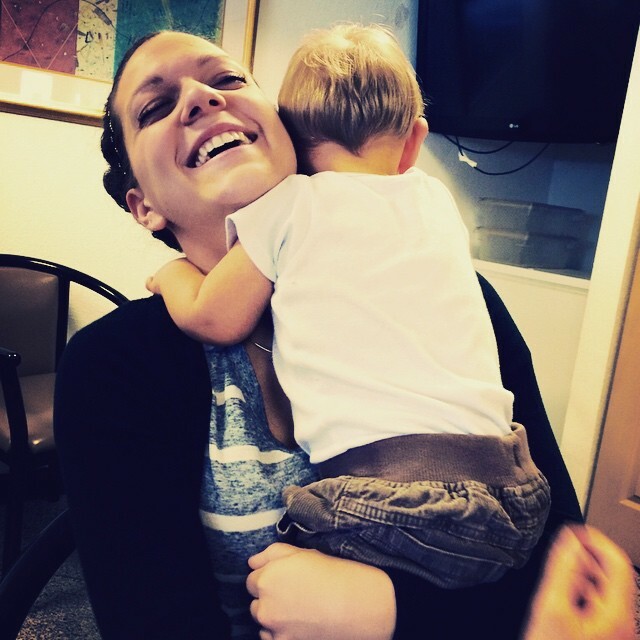 I bring it up because the goal of this blog is to not only give you a window into our adoption experience, but to education on adoption-related issues, I do want to focus a little more on the difficult moments in order to give a broader perspective on what this process is usually like. We have had more than our fair share of sunshine and roses in the attachment process, but you can check out my Instagram if all you want is a dose of cuteness. Let’s dive a little deeper on here, shall we? In a lot of ways, adoption is like an arranged marriage, at least from the parents’ perspective. Without much (if any) prior relationship development, you are suddenly tied to this person for life. On the parental end, there might be some element of “love at first sight”, but it is a “love” born from anticipation and longing, the kind manufactured from the ideal you have been shaping in your mind for months or years of waiting and dreaming. It is not the sustaining love grown from an intimate relationship fortified by the deep knowing of the other person. It could probably be more closely labeled as “infatuation”, maybe (in some cases) with a giant dose of maternal/paternal protective instincts mixed in. But from the child’s perspective (particularly for young children like Elliott), this “arranged marriage” is often anything but welcomed, let alone longingly anticipated or even expected. For kids who have never bonded with a caregiver, this means entering the relationship without even the concept of love in their brains. For a kid like Elliott, it means entering the relationship while already deeply in love with someone else. Either way, you are matching up parents who have been bursting at the seams with longing to a child who’s feelings toward them are somewhere on the scale of ambivalent to outright hostile. For these children, the experience of being adopted is more like the experience of being kidnapped. … when he does everything in his power to make sure you know that he. does. not. want. you. That, my friends, is heartbreaking. When you are isolated from your support system and anything familiar, and your whole world has shrunk to the size of a tiny apartment with a child you want so desperately to love you the way you want to love him/her, it becomes extremely easy to lose sight of the finish line. It becomes easy to be irritable with your spouse and your new child. It becomes easy to feel resentful of this child who you just emptied your bank account and turned your life upside-down for. It becomes easy to let anxiety and depression creep up. It becomes easy to put on a sunny face for the outside world, because after months or years of anxious waiting, how could you tell them it is falling apart when they (and maybe you) were expecting happily ever after? This too shall pass, and the love waiting on the other side will be hard-won and infinitely worth it. My Heavenly Father went through much worse to adopt me into His family, and I was kicking and screaming all the way too. For us, this phase was mercifully short. When a child is healthily bonded to a prior caregiver, the initial transition is much more painful, but is short-lived. Once they accept you as the new caregiver, they literally transfer their prior attachment to you. This is why almost overnight, Elliott went from pushing me away to never wanting to let me go. But remember: not only was Elliott previously attached to a caregiver he had his whole life (not common), but that caregiver invited us into her home and slowly walked the three of us into being a family (unheard of). 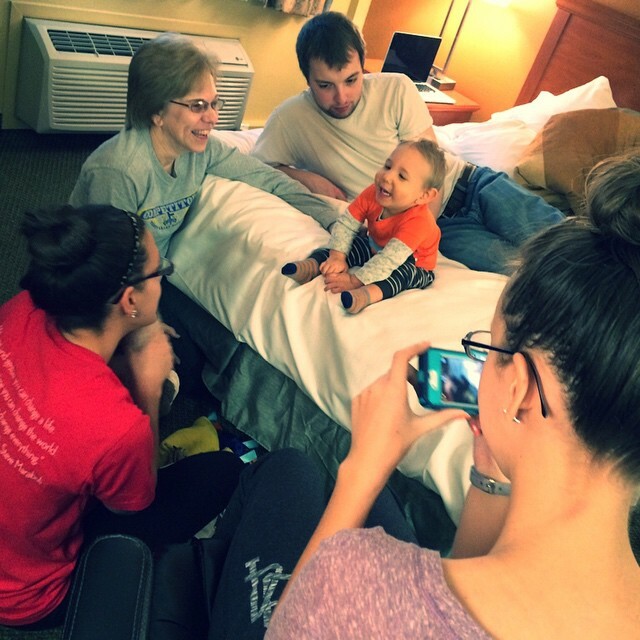 For most adoptive families, this phase can go on for days, weeks, months or even years. I share this with you so that YOU can be an educated support to the adoptive families in your life. Assume they are struggling. Don’t let them walk this road alone. Don’t talk to them like they are in “happily ever after” land – they aren’t. However you can, get in the trenches with them. Give them space to be honest about the struggles and unmet expectations and disappointments they are facing, and let them do it without shame. So, how is life as a family of three now that we are home? Wonderful. And I’m not saying that to sugarcoat the reality or to paint an unrealistic picture for you. I’m saying that as someone who has walked through the fire and come out the other side, as someone who had to earn the love of her child and finally succeeded. There is still work to be done, and I’ll get to that when I answer the question about attachment. But what I want you to know is that adoption will chew you up and spit you out time and time again, and none of it is more devastating than when it is coming directly from the child you fought so hard for. But nothing, nothing is like the first time you come into your child’s room and his eyes radiate with joy and he reaches out to you, because he wants no one but you. Every day in the darkness was worth that first moment of light. These are questions we are asked on a daily basis, and questions I have been dying to answer here on our blog! Today marks two full weeks since Elliott and I have been home from Poland, and so far, there just hasn’t been a good opportunity to sit down and write. 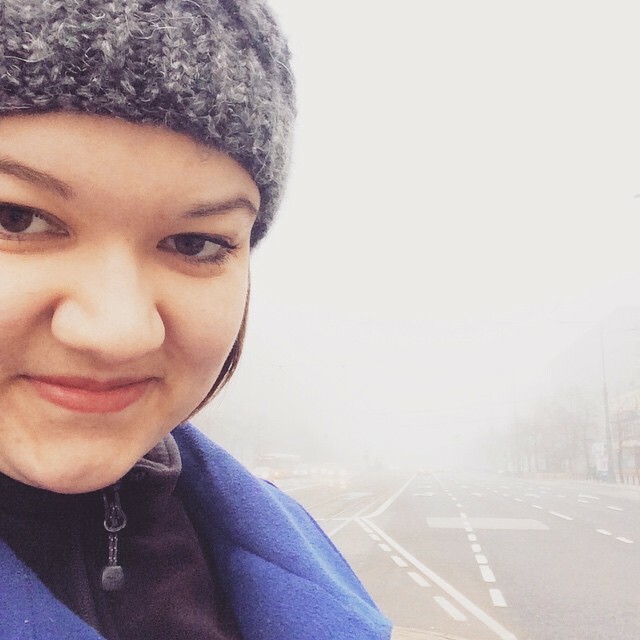 Our first week home was all about adjusting to the time difference and establishing a new schedule (or rather, transitioning our Poland schedule to being here at home). Thanks partially to the advanced time adjusting Elliott and I did on our last week in Poland, and partially to some sort of jet lag magic that sometimes happens on long flights, Elliott was almost entirely adjusted to the time change be the time we landed in Chicago. It took me the better part of these two weeks to feel normal, especially that first week. As soon as the first week was over and I was starting to feel like less of a zombie, Elliott and I both came down with a nasty cold that zapped us for the next week. But today is a new, beautiful (freezing cold) day and we are ready to finally feel normal again! As time allows this week, I will answer these questions and just post them as they are completed. Thank you so much for your warm welcome home to our new life! For starters, the trip home feels like it was about six months ago, so excuse me why I pull the two-week-old memory from the recesses of my brain. To put it lightly, the trip home was a roller coaster. The flight itself went wonderfully (considering the circumstances), and aside from an army of Polish grannies who spent the better part of the 10 hours trying to pry Elliott from my arms and squish his cheeks right off, it was a breeze. 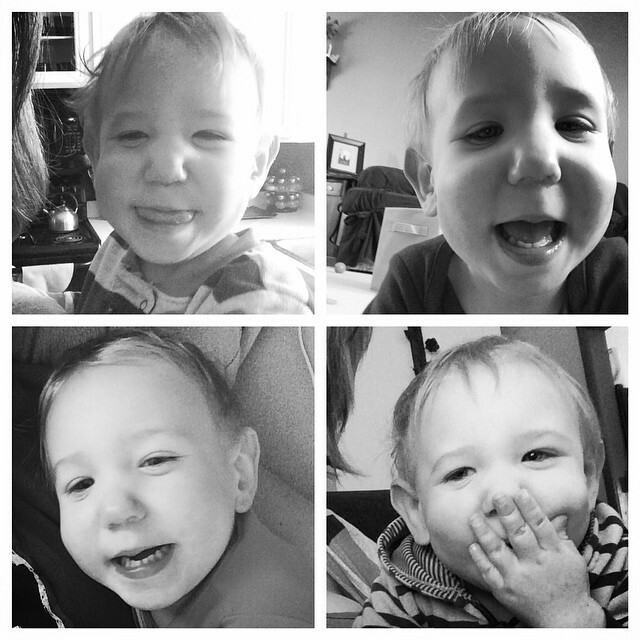 Elliott has learned to be extremely adaptable and resilient in his twenty months of life, and was an absolute angel on the plane. He devoured airplane food with enthusiasm that I guarantee rivaled every other passenger, slept for three hours stretched out across two empty seats, played happily with the toys I packed, and barely fussed at all on take-off and landing, all while charming everyone around him, as is his custom. Getting on the flight was a whole other ball game. 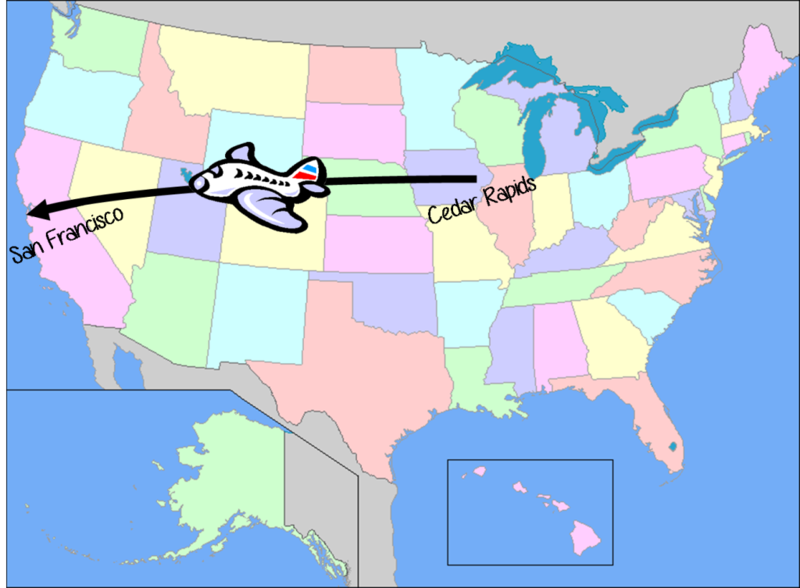 We thankfully had only one direct flight from Warsaw to Chicago, and knew the most difficult part of the entire trip would be the process of getting from our apartment to our seats on the plane. On top of having a squirmy toddler, we also had more pieces of luggage than we had available hands. And although we were anticipating a bit of a struggle, the problems we encountered were so far above and beyond what we expected, it blows my mind that we actually made the flight. The details would take up this whole blog, but to put it shortly … basically, a computer error caused our three reserved seats (Elliott, myself, and my sister) to somehow translate to only two printed tickets. Fixing this problem at the check-in desk took over an hour, and many insanely ridiculous complications later, we were sprinting through the airport trying to catch our flight while the words “Last call …” blared at us over the speakers. I have done a far amount of flying in my life, and NEVER have I come so close to missing a flight nor have ever experienced so many unbelievable challenges in getting on one. I have never been so relieved to reach a destination. As much as I truly loved Poland, stepping off that plane onto home soil after two incredibly stressful months away brings tears to my eyes even now. We made it. And I don’t just mean the flight. We made it through security, customs, and immigration faster than expected, and with a big stamp in his brand new passport, Elliott became an American citizen. Coming through baggage claim and seeing Alex holding steaming coffee in one hand and ice water in the other, I thought I might pass out from joy. We made it. Although I hadn’t slept in over a day, walking out of that airport into knee-deep snow and loading Elliott into his car seat, I felt like I could have run a marathon. The last two months, the last year and a half … all of it had felt like falling uncontrollably, not knowing where or how or when I would land. In that moment, and in many moments since, I felt warm all over, as if that long fall ended with a gentle landing in a mountain of fluffy pillows. WE MADE IT. The rest of the trip home flew by. My parents and other sister, as well as Alex’s sister, brother-in-law and our niece, drove out to Chicago to meet Elliott, and we spent a wonderful day and half fawning over Elliott and spoiling him rotten. It may have been February, but we opened presents like it was Christmas morning and did enough celebrating to equal it. 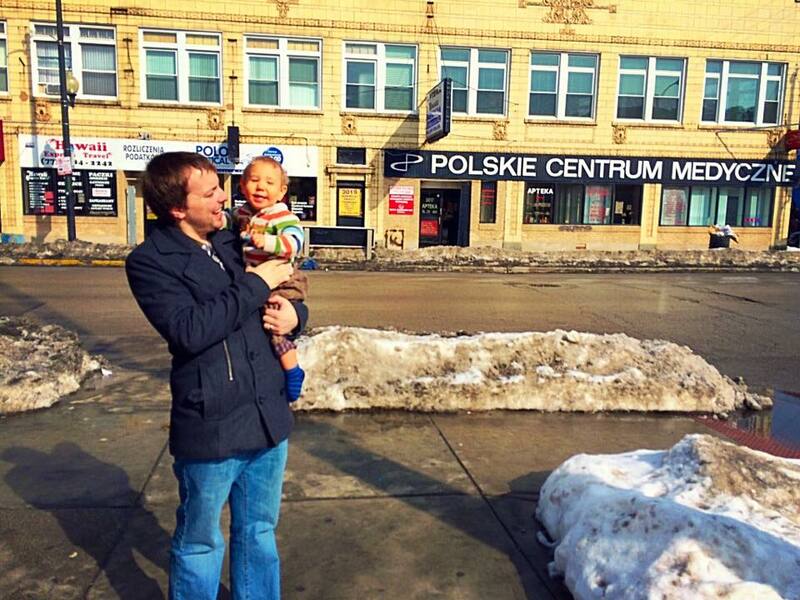 We introduced the family to the amazing Polish food we have come to love by having lunch in the Polish district of Chicago. It felt like my worlds were merging as I watched my family tentatively sample beets and sauerkraut, pirogis and dumplings, cucumber onion salad and all kinds of pork. I even got one last taste of the well-known Polish hospitality as the manager of the restaurant escorted me to her office to change Elliott’s diaper rather than use the bathroom. I blinked and the weekend was over, and suddenly we were loading up the car for our drive home to Iowa. Before I knew it, the moment I have been imagining for years was right in front of me, as we pulled into our driveway and told Elliott he was home. We showed Elliott around the house, laughed as he met the dogs (where he received his first less-than-thrilled welcome), and drank in every delicious moment. I wanted to wrap my arms around everything I could see … Elliott rolling around with the dogs, Alex overjoyed at being with us again, the familiarity of home … and savor it as long as possible. My life had changed so much since the last time I was here, and I could barely process all that we had gone through in those two thrilling, exhilarating, agonizing months, to say nothing of all the ones before them. Yet, here I was. I was home, and absolutely astonished that against all odds, we had finally come out the other side of the journey. Despite my endless doubting, the finish line was real, and it was indescribably glorious. Before falling into bed (MY BED IS THE MOST COMFY BED IN THE WORLD. Sorry, sometimes that still overexcites me. ), we headed over for a welcome home gathering at Alex’s parents’ house, where we were greeted by local family and our small group. Although our plan was to lay low over the next weeks and/or months, we decided to have this one weekend of communal celebration before going into hibernation. Oh, was it needed! I hadn’t seen a familiar face in months, which is a daunting task in itself for this extroverted people-person going through the biggest, most challenging life change of her existence. It was a refreshment for my soul that I would need to help me through the coming weeks of adjustment. 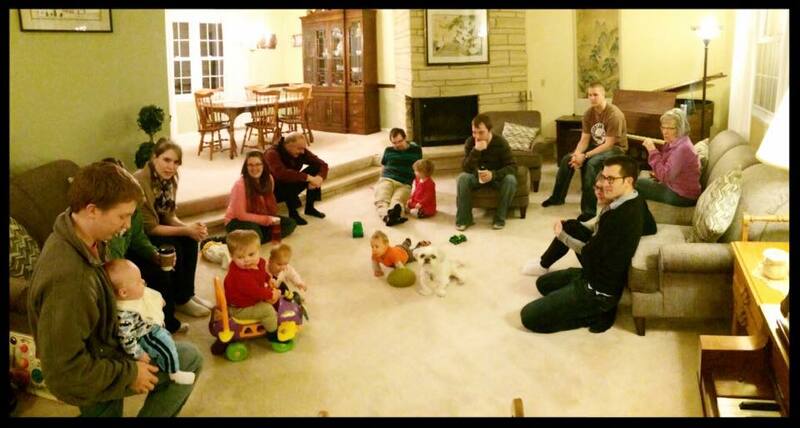 Wow, how I missed these people! Seeing Elliott with our family and closest friends was absolutely surreal. And just like that, our homecoming weekend was over, and I was finally, gloriously, curling up in my bed (MY BED!! MY BED!!!!). Elliott was tucked into the crib next to me, the dogs were piled on top of me, and Alex was an arms-length away once again, which sure beats 4,000 miles. I fell asleep thanking God for all that He had done, knowing I could never, never thank Him enough. When we were preparing for our potentially two month long trip to Poland to complete our adoption of Elliott, I was at a loss as to were to begin on packing. Not only had I never had a toddler, I had never had a toddler dealing with the unique circumstances of adoption. There was so little suitcase space … what was I supposed to bring? What would be most helpful to have? I did a lot of Googling around, trying to find suggestions of things to pack. What I mostly found were packing lists of how many shirts and onesies and bottles to bring. And while all of that was essential, what I was looking for were the less obvious things – the things that I might not think of, or things that would be helpful not just for a toddler, but an adopted toddler. Now that we are closing in on the end of our trip (hopefully! ), there are a few things that we have found to be essential to our adoption travels. If you are traveling to adopt a toddler and find yourself scratching your head when it comes to packing like I was, hopefully you find this helpful! Our carrier has been such a huge help for attachment. As much as possible, we try to use it instead of the stroller for day-to-day traveling around. Elliott wasn’t familiar with being in a carrier at first, but soon realized he would much rather be close to one of us than sitting in a stroller. On days when he is especially clingy, I’ll put him in the carrier just for hanging out in our apartment. Furthermore, a stroller just isn’t practical in old, cobblestone cities built in the pre-handicap accessible days! Elliott is small enough still to be in a front carrier so that we are face-to-face, which is great for bonding. Ours is this Boba Carrier. As we learned about Elliott’s daily schedule, we have found it incredibly helpful to keep a journal. Every day since we have had him, we keep a detailed record of his daily activities. This as been a lifesaver in helping us learn his likes/dislikes and how different things effect him, such as changes in his eating or sleep habits. It has been our greatest tool in establishing his daily schedule. 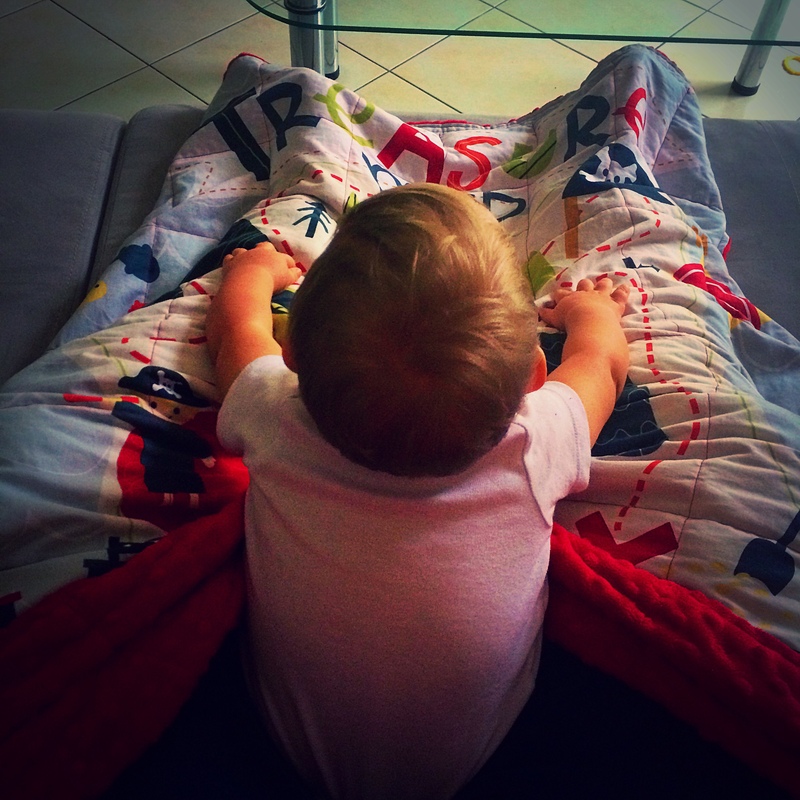 I can’t say enough good things about our weighted blanket! We use it during every nap time. When we first took Elliott from his foster home, he had a lot of trouble falling asleep. We started covering him with a weighted blanket to help him calm down, and it made a huge difference! If you are not familiar with them, weighted blankets can have a soothing effect for kids dealing with anxiety, trauma, sensory processing disorders, ADHD, Autism, etc. Ours is silky soft on one side and has a treasure map on the other side. It’s from StudioMinkyz Etsy Shop and we love love love it. This felt like a splurge purchase at first, but now I am SO GLAD we got a video monitor rather than an audio-only monitor! Elliott is normally a really deep sleeper that doesn’t move around much or make noise at all. But normal sleep is one of the most common things to go out the window while processing stress/grief/trauma, and that has DEFINITELY been the case for him. Because we do not have a crib and are co-sleeping, the video monitor lets us keep a close watch on him while he naps to make sure he has not breeched the pillow wall in his sleep and is getting close to the edge of the bed. Plus, little kids make so many weird noises in their sleep, the video monitor has been a huge asset as we are getting to know him. Being able to see him helps us decide if each little noise means he is just squawking in his sleep or actually needs us to go in there. This is the video monitor we have, and we love it! Do to packing constraints, we weren’t able to bring many toys. People always say that kids can have fun with anything around the house, but when you are basically locked in an apartment for two months that is furnished with the bare minimum, even those options are slim. But there are two stuffed animals in particular that we are very glad we have with us. One is a teddy bear that Alex and I made for Elliott at Build-A-Bear Workshop while we were waiting to get our travel dates. We kept it in our bed so that it would smell like us by the time we arrived in Poland. It was the first gift we gave to Elliott when we met him, and he has really latched on to it. It is nice to have something soft and cuddly that he can associate with his new parents! The second is a small stuffed dog that belonged to him in his foster home. If possible, it is great to take a familiar toy home from the child’s previous home. The doggy is a source of comfort that reminds him of being somewhere that he felt secure, and carries the scent of his past home and foster mother. We are very glad to have both of these toys! Seriously, I don’t know what it is about these things. They are like catnip for kitties. Something about that soft fabric lined in those irresistible silky tags makes babies and toddlers go nuts. We were given one at our adoption shower, and I am SO thankful I tossed it in the suitcase last minute. Elliott hated getting dressed and having is diaper changed at first, and the taggy blanket was just fascinating enough to distract him. To kids that have been in a foster home or orphanage where they were not the center of attention, being adopted often means sudden, constant stimulation from excited new family members. That, combined with stress/anxiety, makes it often difficult for Elliott to wind down for naps and bedtime. Even when he was exhausted, his body still wanted to move. 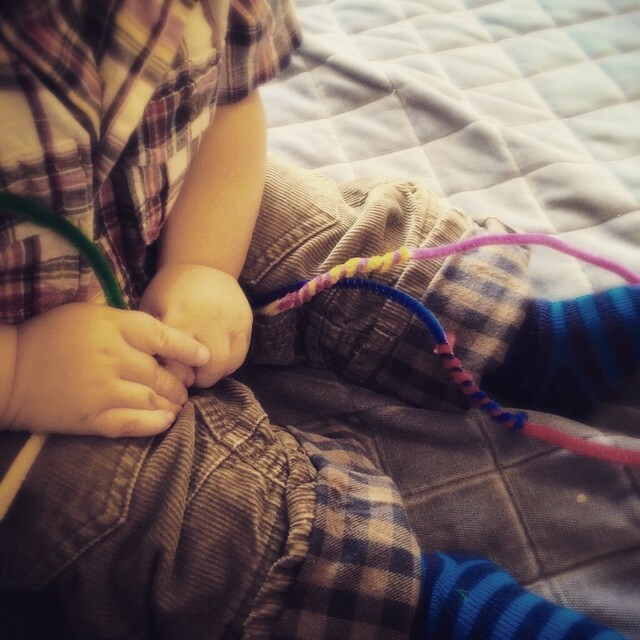 The taggy blanket is an easy way for him to slowly calm down while keeping his hands busy, as he could probably spend an hour exploring all of those colorful tags. Our Gummi Mat is basically a rubber mat that lays on top of a high chair tray. It is just sticky enough to grab on to the tray, and has bumps on top to help keep food from sliding away from little hands. 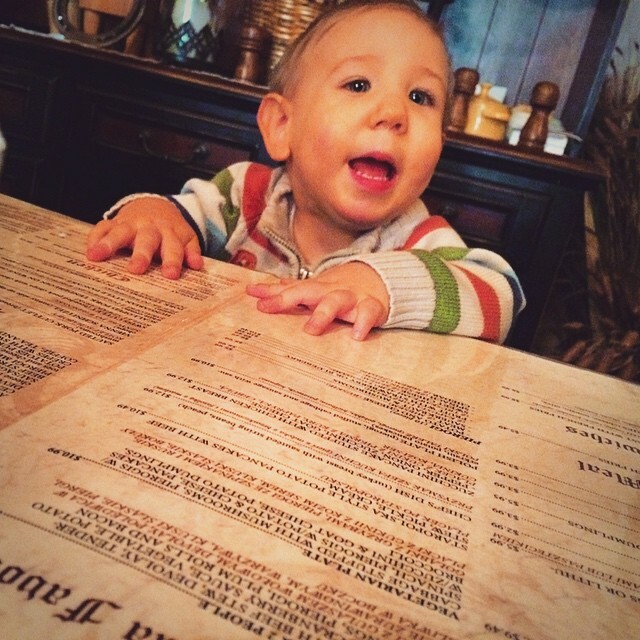 When we met Elliott, he had only ever been hand-fed, even though he is the age the most toddlers start picking up finger food. We think it is more common in the U.S. than other countries for kids to start eating finger food sooner. 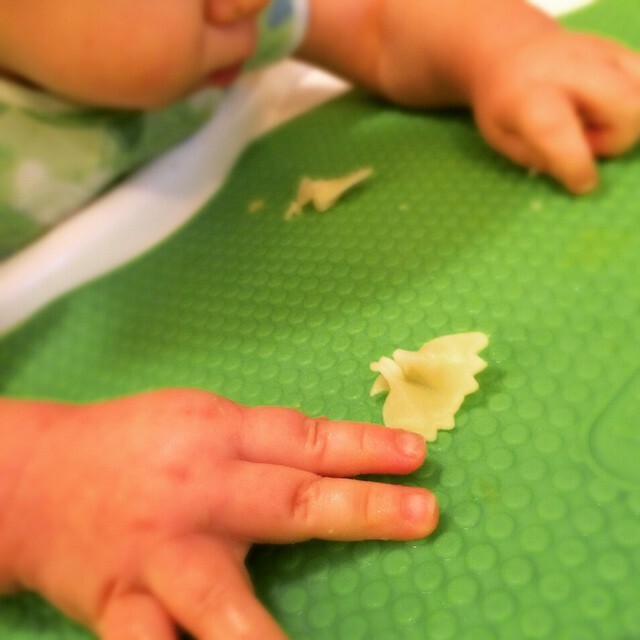 Elliott’s physical/occupational therapists encouraged us to encourage him to eat finger food himself, as this would help improve his developmental delays. Because this was totally new to him, it took him awhile to get the hang of picking up small food pieces on his own. Without the mat, he ends up just chasing it all over the tray as it slides away from his wobbly fingers. The mat makes a huge difference! 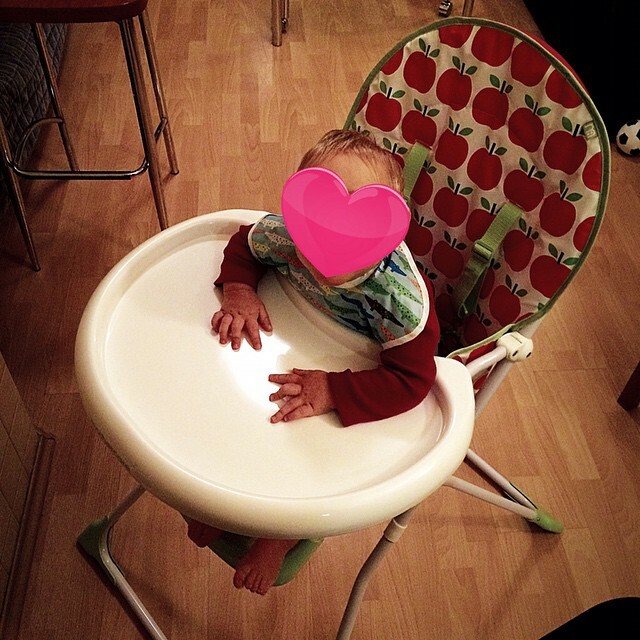 Because it helped him so much in picking up food, his fine motor skills progressed enormously in a short time. Plus it is super easy to clean and rolls up easily to be out of the way between meals or to stick in the diaper bag for on-the-go. Love it! Here is the one we have. Yesterday Alex left to to return home to the U.S., and rather than sit home and be bummed about it, Elliott and I spent the afternoon out and about. We took a tram trip to a big mall on the north side of the city and spent a couple hours browsing around and having lunch in the food court. On the way home, Google Maps took me on a tram route I had not been on before, which dropped us off on the opposite end of our street than usual. This end of the street was far more deserted, but it was still daylight and I felt safe and content strolling down the snowy road with Elliott strapped to me in the carrier. Since I hadn’t been on this end of the street before, I took my time walking home to see what shops and restaurants were on the way. And then, just a block or so from our apartment, I came to something that stopped me dead in my tracks. Tucked between the row of shops was a narrow piece of a building featuring only a small window front. The window did not look into the building, but was rather the front of a large, glass box. The bottom of the box was lined with soft-looking blankets and pillows, similar to what you might see in a baby’s crib. Then I noticed that the window I was peering into wasn’t a window at all, but a hatch-like door that pulled open from a handle at the top, similar to the hatch where I drop packages at the post office near my house at home. It was a baby drop box. The realization felt like a punch in the stomach, and I stumbled back away from it in horror. A baby drop box. Standing there in the snow with my once-orphaned, once-abandoned son resting against my chest, the realness of it all was too much to bear and I felt the urge to vomit right there on the sidewalk. Elliott rubbed his eyes against my collarbone; it was time for his afternoon nap. Even so, I felt rooted to the spot, unable to tear my eyes away from the contrast of the soft bedding and the cold metal handle of the hatch door. This could have been him. I corrected myself immediately, the sick feeling in my stomach getting stronger. This was him. He may not have been left in a baby drop box, but this was the start of his life. It hit too close to home. Right here in front of my eyes, not two feet away. Just one day after our adoption of him was complete, I felt the weight of orphanhood unlike anytime before. On the spot where I was standing, mothers just like me have felt the greatest pain of their lives. I tried to imagine unstrapping Elliott from me, pulling on the cold, metal handle, laying him down and then having to make my legs walk away. It was something I could not even fathom, and yet is enough of a reality to warrant the existence of such a thing. Baby drop boxes have been getting a lot of attention recently with the documentary coming out in a few months about a particularly well-known one in Korea. I have watched the trailer and read articles about the countless babies whose lives have been saved through these drop boxes – babies who would have otherwise been left to die alone. And each time I have rejoiced at the chance at life they have given, the good work the drop boxes accomplish. I have mentally commended those who devote themselves to such an incredibly worthy cause. Even though all of that is still true, accidentally and unexpectedly stumbling upon one with my brand new son, I was overwhelmed by the other half of the equation. The mothers. The fathers. 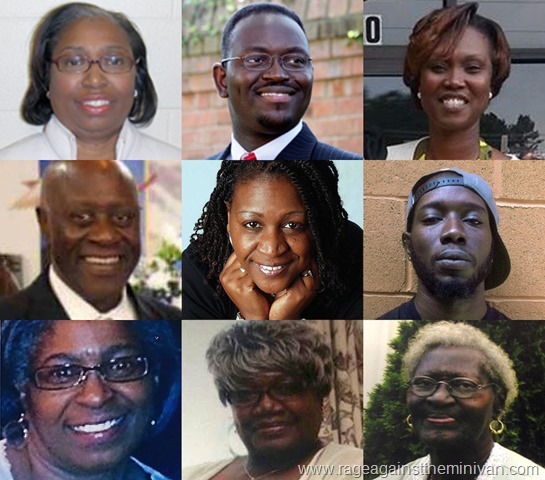 The grandmothers and grandfathers and aunts and uncles and cousins who never were. The guilt and the grief and the “what ifs”. The babies who turn into children who must carry the weight of abandonment and trauma and grief even after they are a part of a loving family, if they even get that chance at all (most won’t). It is nice to think about the babies that are saved from being left to die. It is comfortable and makes us feel warm and fuzzy. And while I truly rejoice at those saved lives, my heart aches for the chapters that came before and after the drop box. The chapters of grief and despair and of having no other options, and the chapters of orphanhood. The chapter of orphanhood is one I now know well. It’s one I have seen with my own eyes, up close and raw and personal. I’ve rocked it sleep, I’ve held it while it sobs from grief, I’ve stayed up all hours watching it beat its head on the bed from trauma-induced night terrors. Orphanhood is truly a nightmarish burden carried by the world’s most innocent and vulnerable. Standing there in front of the drop box, it was this side of the story that turned my stomach. When I finally pulled myself away, I took a mental note of the sign above the window, planning to research it when I got home, naively hoping I misinterpreted the blanket-lined box. It took only a quick internet search to confirm what I had seen. 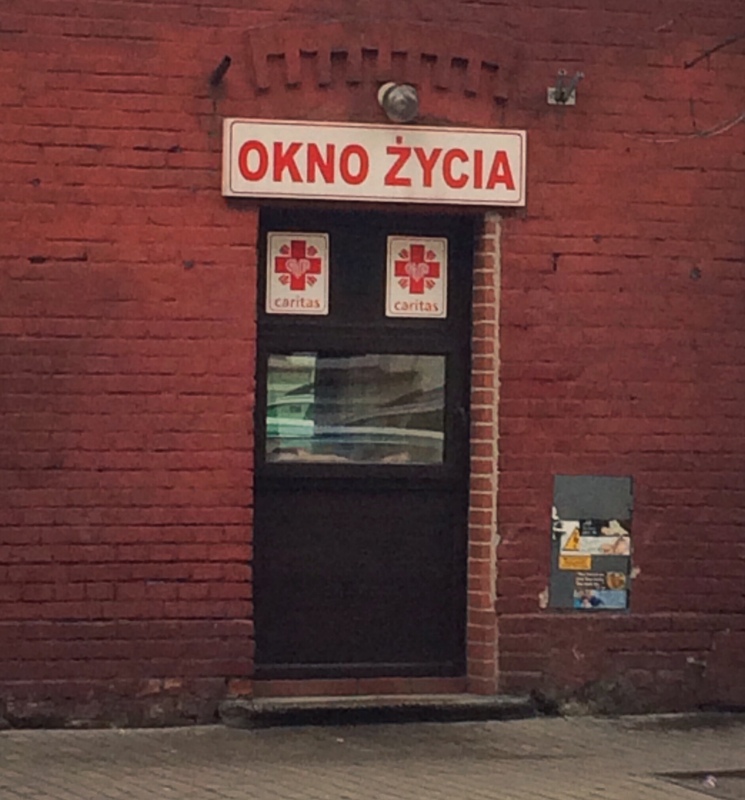 The sign said “OKNO ŻYCIA”, which means “Window of Life”. I haven’t been able to get the encounter out of my head since, feeling scared to even walk down the street to have to pass it again. Even so, I am thankful that I came across the baby drop box. It confronted me with a lot of realities and a lot of emotions that have given me a more complete picture of a complex issue that is very personal for me, especially in light of my own recent life experiences. Now when I hear about these baby drop boxes that used to feel a million miles away, I will not only celebrate the incredibly courageous men and women who devote themselves to caring for these abandoned children, but will always remember how it felt to stand in front of one with my once-orphaned son in my arms. Just like adoption, these baby drop boxes represent a mixed bag of redemption and loss, and I never want to forget the incredibly horrible and incredibly beautiful reality of those two things in tandem. Every day for the last 605 days, a sweet little boy fell asleep at night labeled as an orphan. Last night, that little boy may have gone to bed an orphan, but he woke up a son. 7:00 – Good morning! Elliott usually sleeps about ten hours to the minute, and is almost always up between 7:00-7:15 regardless of what kind of night we’ve had. Hopefully we have had no night terrors in the night and are all feeling well-rested. 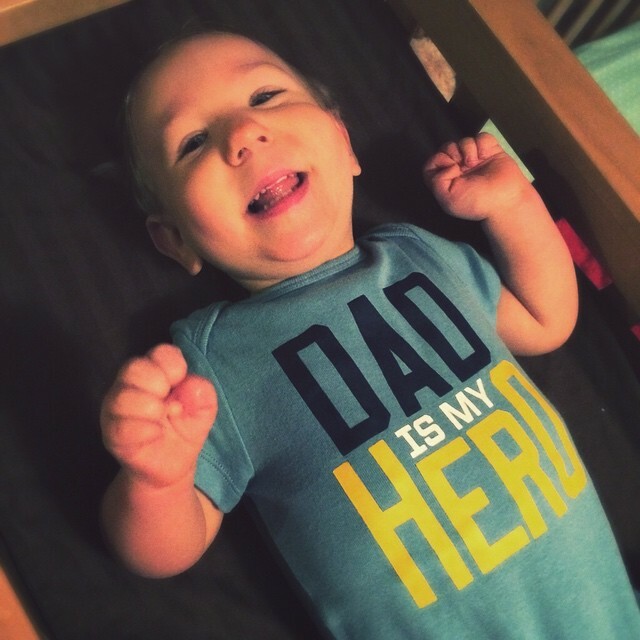 No matter how Elliott slept (or didn’t sleep) he always wakes up grinning from ear to ear! 7:20 – Bottle O’Clock! After some smiles and snuggles in bed, it is what we call “bottle o’clock”. Elliott starts the day with a bottle of porridge. 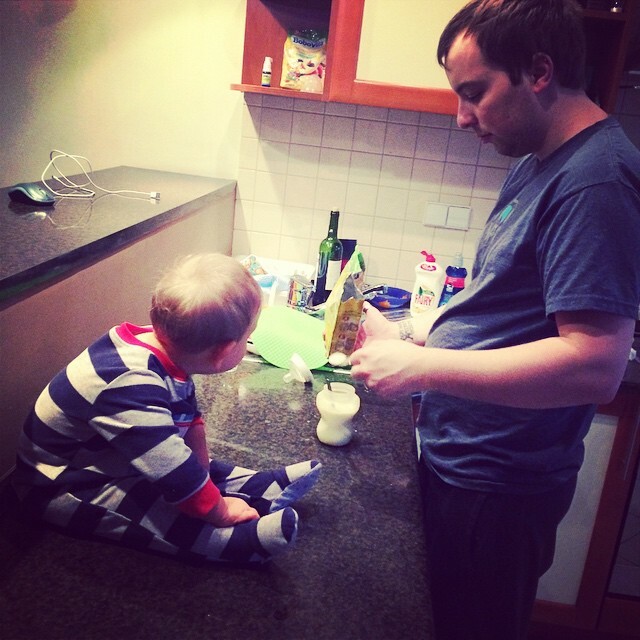 Alex is the bottle master and almost always makes and gives Elliott his bottles. The porridge Elliott likes is only made and sold here in Poland, so we are either going to have to stock up on a LOT of it for the trip home, or find some sort of American equivalent to trick him into liking, because baby can’t live without his porridge. 7:45 – One of us will then change and dress Elliott for the day while the other goes on our morning coffee run. Our apartment doesn’t have a coffee maker, and since drip coffee is not popular here, we have not been able to find a store that sells the coffee pots we are used to. There is a coffee shop less than a block away that makes fantastic Americanos, so that is where we go most mornings. Often we’ll stop at the bakery on the corner for fresh croissants or pastries for breakfast, too. 9:00 – Breakfast! Elliott’s breakfast favorites are scrambled eggs, banana, kiwi, pancakes, and oatmeal. Plus nibbles from our pastries, obviously. 9:45 – Once we are cleaned up from breakfast and teeth are brushed (Elliott has been having his teeth brushed after every meal since the appearance of his first tooth – go Baba! ), we have some morning playtime. We usually let Elliott play on his own in the mornings. 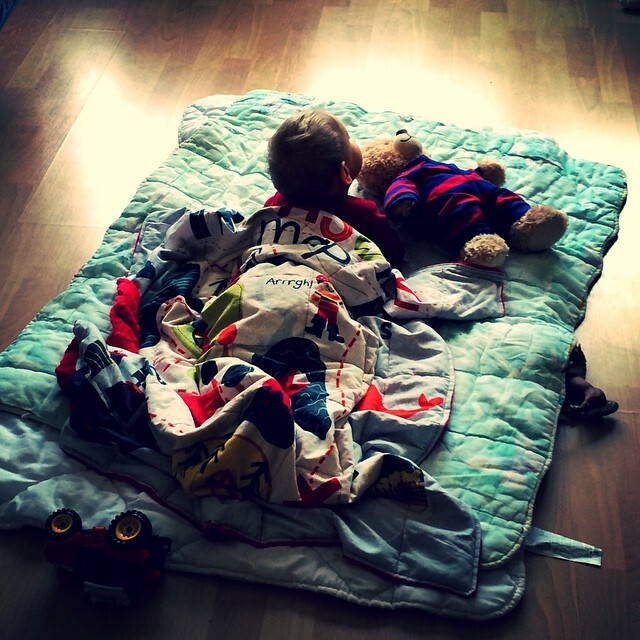 We used to play with him constantly, and then learned that he is used to spending most of his time playing independently and the constant stimulation from us was making it difficult for him to wind down for naps and bedtimes. When he isn’t watching out the window, he loves to push any of his wheeled toys around the tile floor and scoot around after them, or swish his dollar store strands of beads all over the floor. Usually while he is playing, we take turns showering and getting ready for the day. 10:30 – Usually around this time we will put on an episode of Curious George and snuggle Elliott to settle down for nap time. 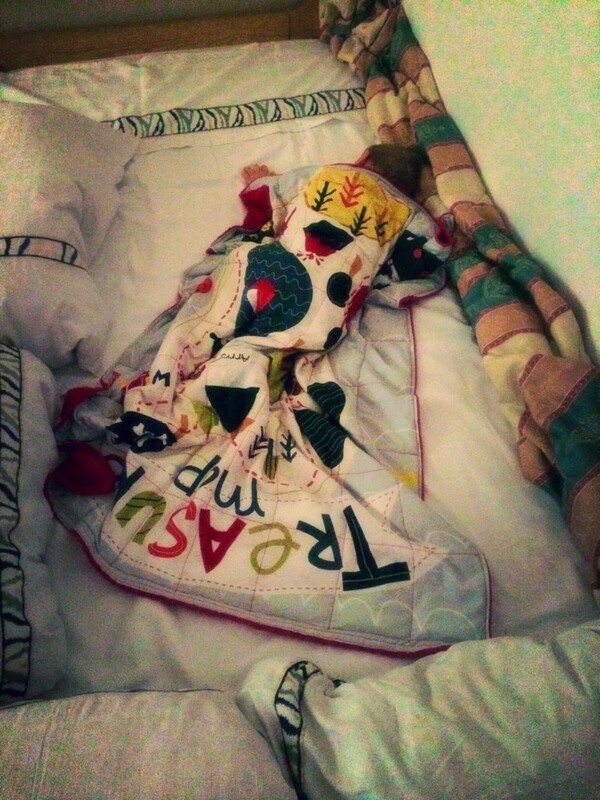 10:45 – I take Elliott in the bedroom and rock him or snuggle him until he is ready to fall asleep. 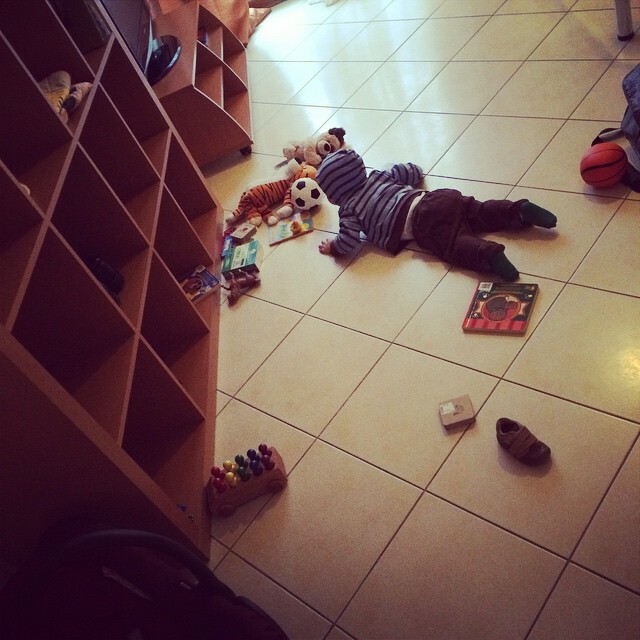 11:00 – Nap time! During nap time we have a bit of time to hang out together and plan any afternoon outings (read: watch an episode of The West Wing). Waking up is hard work. 12:00 – Lunch time! If we aren’t in a hurry, usually we try to give Elliott something for lunch that he can feed himself, like any small finger food. Elliott had basically no fine motor control when we met him, and one of his therapists suggested we start encouraging him to feed himself. Up until this point in his life, Elliott has always been hand-fed. (My sister has cared for toddlers/preschoolers from many different countries, and said that in a lot of other cultures, kids are hand-fed until they are at least 3 or 4 years old. Anyone know if that is the case in Europe?) 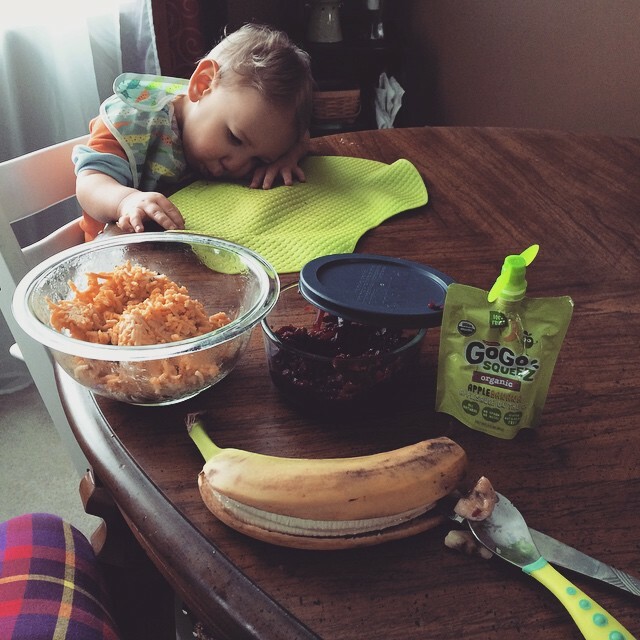 His lunch favorites are sliced turkey, swiss cheese, bananas, beets, and bowtie pasta. Alex and I will usually grab something easy from our apartment or one of us will run out to pick up something from a nearby cafe or restaurant. 1:00 – Afternoon outing! 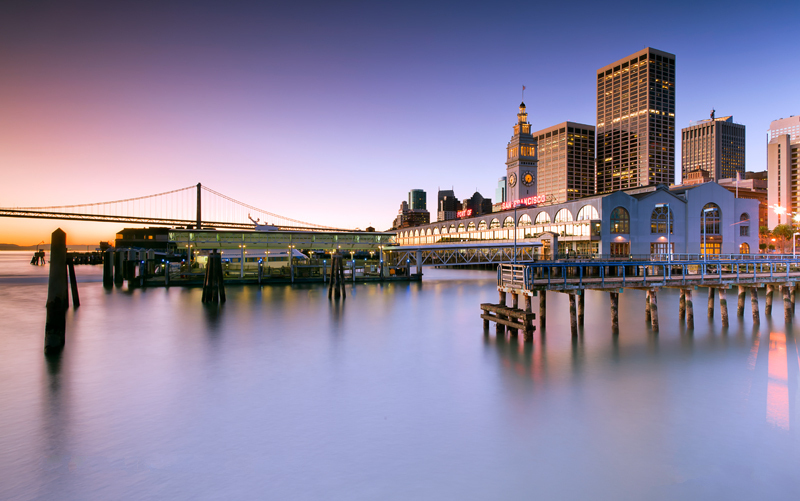 On most afternoons, we will pick a local sightseeing place to visit. We have toured castles, visited monuments, walked around palace grounds, saw iconic parts of the city, and checked out museums. Sometimes we’ll just go to a local park to play on the playground or feed the ducks. 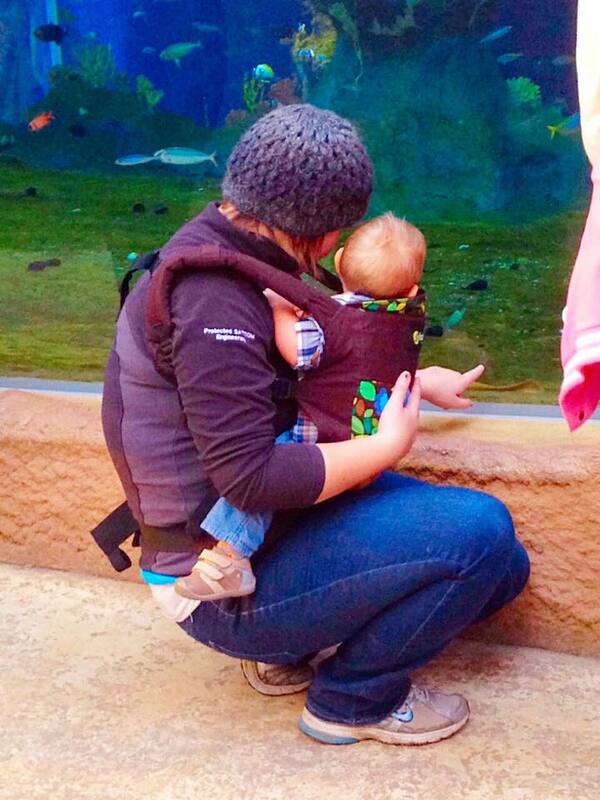 For longer outings, we’ll usually take the stroller, but as much as possible we prefer to use our Boba carrier. It is great for bonding, and with all the cobblestone streets and stairs, this old city is hardly stroller-friendly! Every couple days, we’ll stay in our apartment for the afternoon to recharge instead of going on an outing. 2:45 – Afternoon snack! Oftentimes we are still out or on our way back at this time, so Elliott usually has something portable like a little pouch of applesauce. If we are in our apartment, his favorite snacks are bananas and cottage cheese. 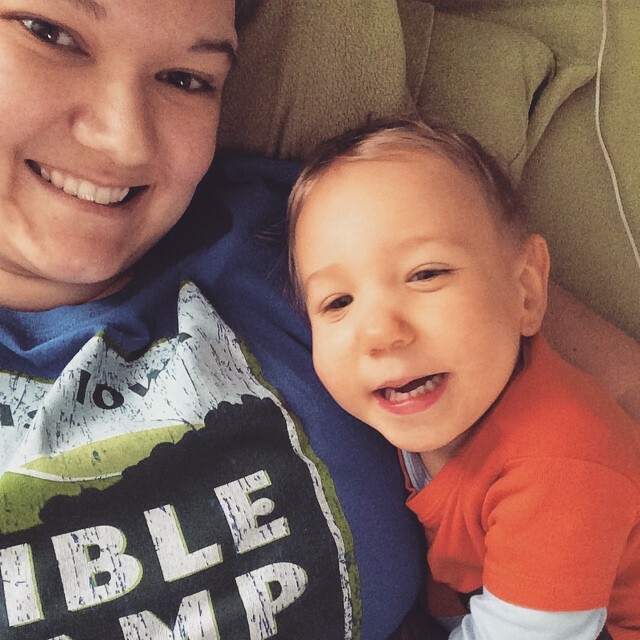 3:30 – Sometime around now, we get Elliott ready for his afternoon nap and rock/snuggle him until he falls asleep. This is Alex’s and my main window in the day to get other things done. 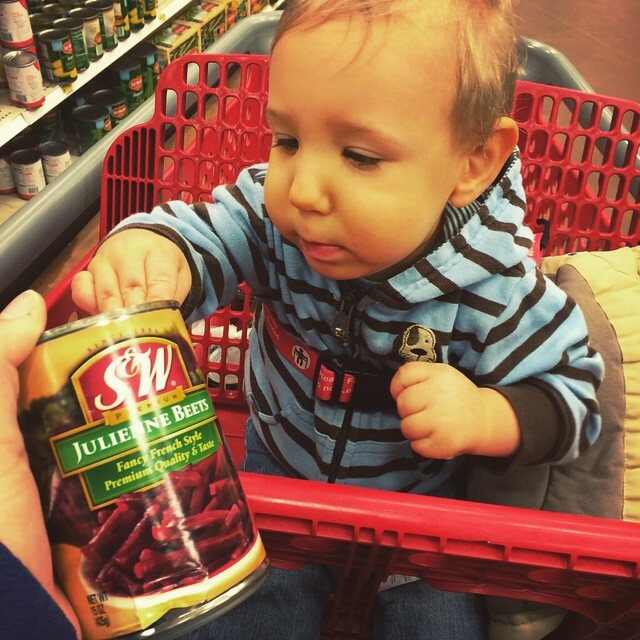 Often I will go out grocery shopping and Alex will work on various adoption-related things, such as scheduling out everything we need to do for Elliott’s visa and passport. If we had a wakeful night, we might also nap ourselves or just have some quiet time (read: watch an episode of The West Wing). 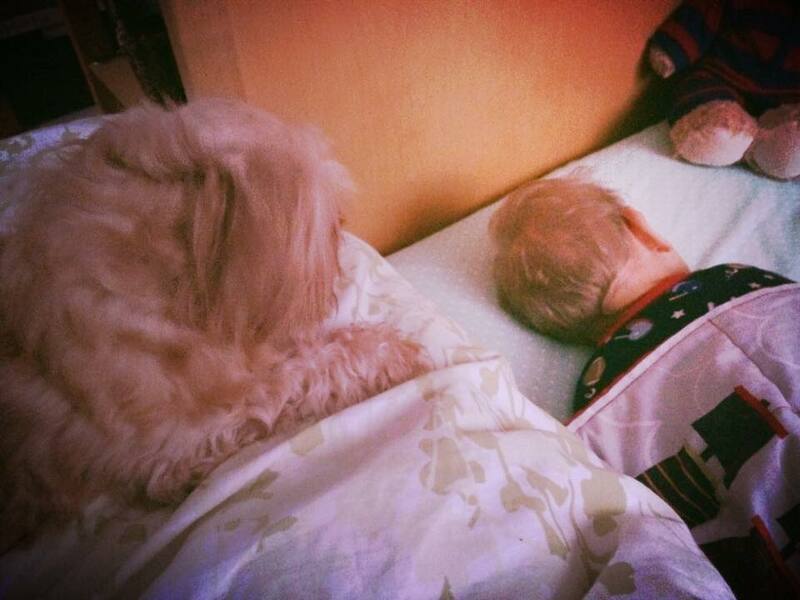 4:45 – Like with his morning nap, we will wake him up if doesn’t wake up on his own. His afternoon nap is usually about an hour and fifteen minutes long. After he has fully woken up, we usually have lots of good playtime where we play with him directly. We like reading books, playing with blocks, rolling balls back and forth, singing and dancing to music, and working on sensory activities from the occupational therapist. 6:00 – Dinnertime! We almost always have dinner in our apartment. Even though it is often easier and quicker to grab something easy, I enjoy cooking and we like having some home-cooked meals that taste like home! For dinner, Elliott usually eats whatever we are eating. 6:45 – Elliott is usually very active and happy after dinner, so usually we will play together and specifically do some physical therapy practice. He is getting really good at crawling on his own! 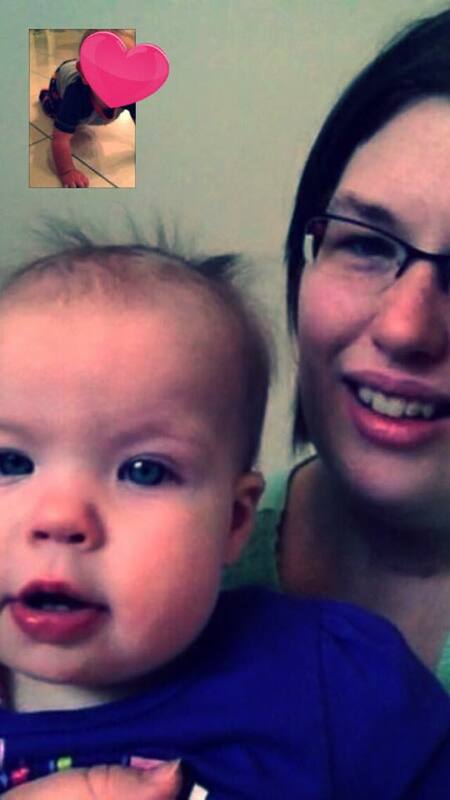 During the evenings it is early afternoon in the States, so we will also often video chat with a different family member so they can see Elliott and we can keep in touch with life back home. 8:00 – Bath time! This is probably the highlight of Elliott’s day – he LOVES baths! It has been a great way for Alex to bond with Elliott and really quiets Elliott down for bedtime, so we have incorporated it into our nightly bedtime routine. Alex bathes Elliott and the two of them soak the entire bathroom with their craziness while I get everything ready for bedtime. 8:30 – Bottle O’Clock! While Alex makes the evening porridge bottle, I get Elliott ready for bed – new diaper, pajamas, lotion, and relaxing essential oils. Then, it is porridge time! In his evening bottle, Elliott also gets an iron supplement and some vitamin D drops – the drops are common for kids around here this time of year because there is so little sunlight (it is dark by 3:45 in the afternoon and cloudy pretty much always). 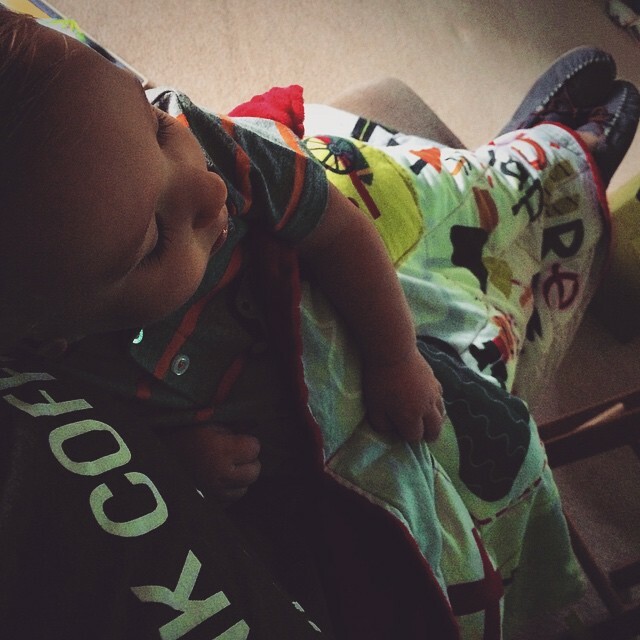 8:45 – When Alex is finished giving Elliott his bottle, I take him to bed. After some singing, rocking, and snuggling, he is ready for sleep. 9:00 – Elliott’s bedtime! Once Elliott is out, we can relax! We usually get the apartment cleaned up from the day, enjoy a glass of fabulous European wine, and kick back after another full day in toddler adoption world (read: watch an episode of The West Wing). 10:30 – Usually around this time, we turn in and hope for a full night of sleep and get ready to do it all again the next day! On Friday, January 9th, we woke up early. We had managed to trick Elliott into going to bed an hour early so he would wake up naturally in time for us to leave. It was Court Day! In some ways, it felt like just yesterday that my phone rang with the news that January 9th would be the day of our hearing in a Polish courtroom. In other ways, it felt like a lifetime ago. How could it be that it has been less than a month since this munchkin entered our universe? Hasn’t he been with us forever? We had spent the day before packing up our Wroclaw apartment. Anna, our attorney, was picking us up and driving us to court, and the we would return afterwards to collect our luggage and leave for the drive to our new home in Warsaw. I was both exhilarated and exhausted at the thought of the day ahead. I had always expected to feel nervous about court. These were the people that made the final decision. The last word didn’t come down to our agency representatives or attorney who have gotten to know us well over the last sixteen months. It wasn’t even up to the social worker or the child psychologist who had visited us during our bonding period. This entire experience, this journey that has turned us into new people, the solidification of our new family … all of it would come down to a single judge in a single moment, who knew nothing about us except for the stack of paperwork placed on his/her desk. Yet when I woke up before the dim, winter sun on January 9th, I felt entirely calm about the ordeal to come. Elliott was clearly our son. A judge would only need to take one look at us together to know that. In my mind, the day’s procedure was merely a formality to put down on paper what we all already knew as fact. We dressed in the fancy clothes we packed for the occasion (Elliott could not be trusted to stay clean and thus stayed in his pjs until the last possible moment) and met Anna outside our building. Court proceedings for an adoption are done in the district of the child’s current legal guardian, which meant we were heading back out into the country near the foster family’s home. It was a treat to see that familiar countryside again, with its rolling hills, my favorite birch trees, and the huge balls of mistletoe dotting the treetops like an illustration from a Dr. Seuss book. The courthouse was in a town much smaller than Wroclaw, but larger than the foster family’s village. We climbed the stairs to the second floor, Anna balancing her stacks of files in front of her, Alex lugging the stroller, and me with Elliott plastered against me. I was just thinking that we might be able to get him to take his nap through the entire ordeal, when I looked up the stairs to see Baba waiting for us, arms outstretched towards Elliott. Instantly, I was hit with several conflicting emotions. I was happy to see her again, hesitant about how our new role-reversal would impact our interactions, and terrified at what the coming moments might do to Elliott in terms of his attachment to us. As much as I wanted to protect Elliott from the potential confusion of seeing his former caregiver again, I couldn’t bring myself to turn away. Hesitantly, I allowed Baba to take him from my arms. It took him a few moments to register her face. It had been many days since he stopped looking for her around every corner, or watching to see if she was the one to walk through every door. But when he did finally recognize her, his face broke into a grin and he giggled out loud. For a brief, agonizing second, I felt a pang of jealousy. Elliott recognizes me, looks for me when I am not in the room, seeks me out for comfort, and is now always excited to see me. But even so, I couldn’t stop myself from wondering what it would be like and how long it would take before seeing me elicits that much joy. I chided myself instantly, remembering that Baba has been his primary caregiver and only mother-figure for nineteen months, whereas I have only been in his life for barely nineteen days. I may have spent the last seven months dreaming of him all day every day, but he spent that time unaware that I would ever be a part of his life, or that I even existed. I reframed my thoughts to instead look forward to the day when he sees me in the same way he sees Baba, and be grateful that he has been so lovingly cared for as to have such a strong connection with a caregiver. Most orphans are far from that fortunate. Before long, we were ushered into the courtroom. In the flurry of hugs and welcomes outside the room, I hadn’t noticed that Anna had changed into long, flowing black robes accented in deep green. Being the daughter of a lawyer, the detail stuck in my mind. Best as I could recall, he had never donned fancy robes for court. As we entered the room, I saw the judge was also wearing the same black robes, these accented in purple. The judge was a woman, and I smiled to myself. From day one, I have always told Alex that I envisioned our judge to be a woman. She sat perched on a regal gold chair covered in red velvet, and in addition to her robes, had a massive gold chain draped around her shoulders like a shawl. In smaller, but no less impressive chairs, two women sat on either side of her, their robes accented in maroon. On the far side of the room, Baba and Elliott sat on a bench. Parallel to them, we sat on an opposite bench with the wooden, microphoned stand in the middle. I squeezed into the uncomfortable bench between Anna and Alex, with our translated sitting next to him. For the first five or so minutes, we had no idea what was going on. The judge and the robed women next to her spoke authoritatively in Polish, and Anna and Baba responded when questions were directed at them. Our translator said they were just going over formal, legal aspects that begin the hearing, and that it wasn’t important. Every so often I would catch the judge or one of the side-judges eyeing me, sizing me up. I tried to sit up straight and not squirm on the wooden bench, wondering what was being said and feeling like a schoolchild forcing best behavior when the principal walks by. I saw the judge pull out a huge stack of paperwork. I recognized it by the Iowa Secretary of State seal on the top page – our dossier. Slowly and methodically, the judge began turning the pages, out loud describing them for the court reporter’s rapid typing. I felt like I was standing in the room buck naked. That stack of paperwork described every minute detail of our lives – financial, personal, familial, historical, medical, everything. It is easy to collect your entire life in paperwork sitting in your living room, but having it put on display for strangers around a courtroom in a language I couldn’t follow was enough to force me to remind myself again not to squirm. Deciding that my attention obviously was not required at this point, I instead just turned to watch Elliott across the room. 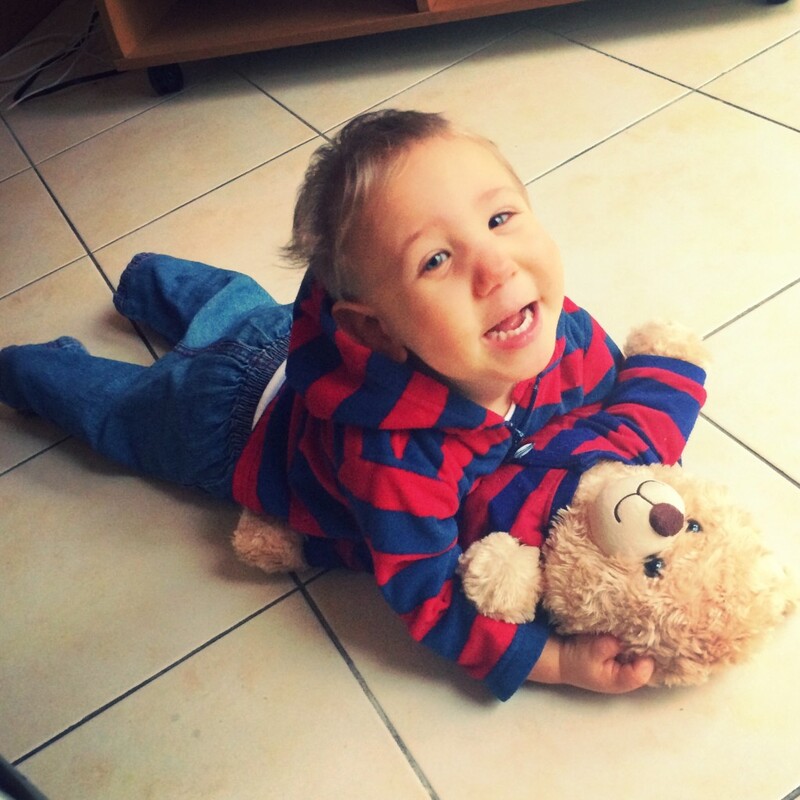 He was playing with Baba and every minute or so would look up and grin when his searching eyes found mine. I smiled back. What a perfect representation of his love for the now two women in his life. Suddenly, Alex was nudging me. I jerked my eyes to the judges, who were all looking at me expectantly. I heard the translator whisper that I was to go to the stand now. Gulp. Shakily, I made my way to the stand. Just feet in front of me, the three robed judges stared me down. The center judge began speaking, and I struggled to know who to focus on. I know that in the case of an ASL interpreter, it is considered rude to focus on the interpreter instead of the person you are speaking with. But I quickly realized that the translator’s style was to speak very softly in English to me while the judge spoke in Polish, not waiting for her to finish her sentence before begin his translation. He spoke so softly as to not speak over the judge, that I found I couldn’t understand him without looking directly at him. It turned out that this was the most challenging part of the whole process. Focus on the judge while listening to the translator, speak in short, simple phrases for the benefit of the translator, all while staying focused and calm enough to answer coherently. Even though we were all saying the same thing, it felt like multiple conversations were going on around me, and I was supposed to stay focused on all of them. The questions came rapid fire. The social worker from the adoption center said the questions would all be ones that we would already know the answer to, which was true. But the pace and the language barrier made the situation feel even more pressure-packed. What is your name? Who are you married to? For how long? Is it a happy marriage? Do you love him? Did you talk him into adopting or was it his idea too? Why adoption? Why Poland? Why have you not tried to have biological children? Do you have any other children in this marriage? In past marriages? In past relationships? What do you know about this child’s medical situation? In what specific ways will you provide for his medical needs? His educational needs? His emotional needs? Financially? Is your family supportive? What is your relationship with your extended family members? This was my favorite question. At the very end, they asked me if I would like to make a closing statement. I wasn’t prepared for this, but it seemed wrong to say nothing. Honestly, I don’t even remember what I babbled in my short, simple phrases. Something about our week at the foster family’s house and how it prepared us for the transition, blah, blah, blah. Hopefully it made sense, whatever it was. Just like that, I was excused. I returned to my place on the bench and Alex was asked to come forward. Sitting down caught Elliott’s attention, and from across the room he started shrieking his happy shrieks, smiling, and reaching out to me. I smiled back, but tried to motion for him to stay quiet. This didn’t work, of course, and after a few moments the judge asked me to take him out into the hall to play. I gathered him up and off we went, settling down on a bench outside the courtroom. Although I was glad for a break, I was also a bit disappointed to miss Alex’s questioning. Just as I was pulling out a couple of toys for Elliott, I felt a gentle tap on my shoulder and heard a soft-spoken man greet me with a Polish accent. It was Jaja! I had been curious why he hadn’t been at the courthouse so far, but hadn’t gotten the chance to ask. 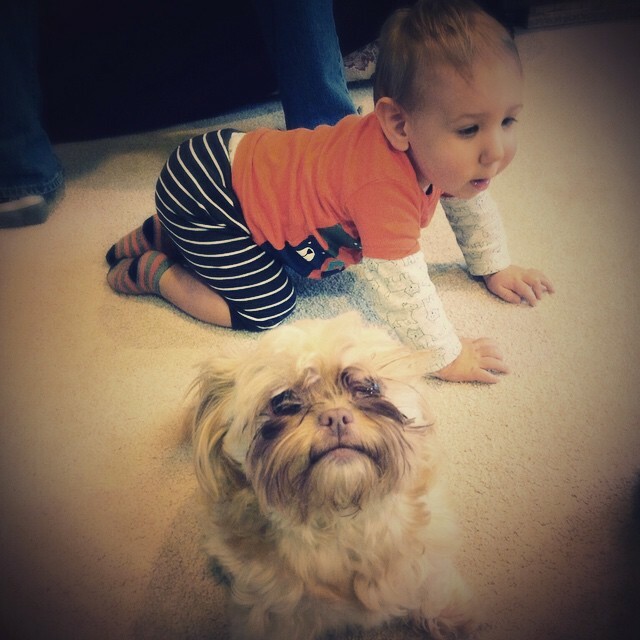 As with Baba, Elliott paused for a moment, looking at Jaja like a memory from a distant dream. Then his face lit up with recognition, and Elliott reached out and place his hands on either side of Jaja’s face. I passed him over to Jaja, who tossed him to the air, much to Elliott’s delight. It seemed like no time had passed before Alex, Anna, Baba, and the translator came out into the hall. Alex said that his questioning was easy and much shorter than mine, as we expected. As the mother, I am assumed to be the primary caregiver and thus require the most scrutiny. Anna said that now we wait for the judges to deliberate and make their decision, and that it would take only a few minutes. Yet, the minutes ticked by. Five minutes … ten minutes … fifteen. It was time for Elliott’s nap, and Jaja offered to take him for a walk outside in the stroller to help him fall asleep. One of the judges poked her head out the door and motioned for Anna to come in. Even though the judges had been extremely positive, I felt a touch of nervousness that their decision seemed to be taking so long. What was there to deliberate? Every few minutes, Anna would scurry back out into the hall and ask some obscure question before disappearing back inside. We had no idea why any of these seemingly random details mattered until we were finally called back into the courtroom. The translator told us that now the judge would read us her decision. The “decision” was actually a fairly lengthy document that seemed like a summary of our dossier – our history, our family, our residence, Elliott’s history, etc. I think I held my breath through the reading of the document until the very end, when the judge smiled at us as she announced that yes, Elliott would be placed with us as a part of our family. She ordered a new birth certificate to be issued with his new name and us listed as his parents. She declared that he would have the full rights and privileges as if he were our biological child, and that these rights would also be true for his children and his children’s children, and so on. The weight of the moment filled the room, and I think for the first time in this long, difficult process, I realized the eternal impact of adoption. His children and his children’s children. We aren’t just adopting a child. We are adopting an entire legacy. Our legacy. His legacy. There would be a mandatory two-week waiting period before the decision went into legal effect, but all of us in the room knew what this meant. After these past sixteen months of paperwork, waiting, stress, tears, and sleepless nights, we were a family. Now and forever, to our children and our children’s children. “O my people, listen to my instructions. Yesterday, while I was waiting for the sad little stovetop in our apartment to boil water for broccoli, Alex called me into the living room to see Elliott crawl for the first time. Now, at nineteen months old, it wouldn’t be unreasonable to expect a toddler to crawling … or walking … or climbing up and down stairs. But at the site of my son grimacing at the effort of a few, independent movements across the floor, my heart swelled with pride at the knowledge of the larger accomplishments that they represent – that he is here at all. And with a small tightness in the back of my throat, I identified an ache that I am sure will accompany the joy of every milestone Elliott reaches. Not only is there a young woman out there in the world somewhere not watching her biological son crawl for the first time, there is a grandmotherly woman not too many miles away who deserves most of the credit. Baba went to school to study sociology and social work, because she always had an interest in people and making their lives better. She was particularly interested in working with and helping children, especially those no one else wanted. In a region of the world where orphanages are the norm, children with special needs are considered an unwelcome burden, and foster care is a new or non-existent concept, Baba’s dream was to turn her home into a place of love and safety for children who had no where else to go. Once her own children were grown and starting families of their own, Baba and Jaja set out to do just that. 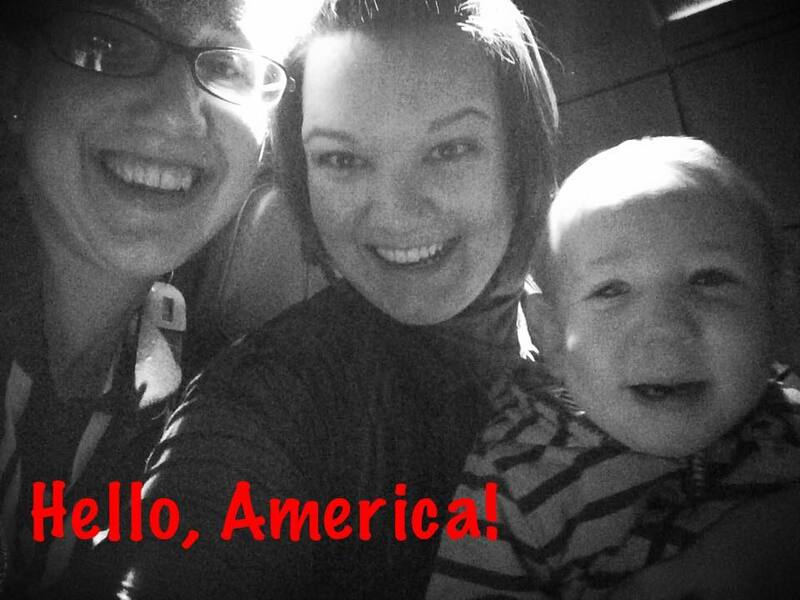 It isn’t easy to be a foster family in a country that is still coming around to the concept. The kids that come into Baba and Jaja’s home come because they aren’t considered stable enough to survive an orphanage or children’s home. They have special physical, emotional, mental, and/or behavioral needs. Many of them require almost round the clock care, and there are never any breaks. There is no respite care, no babysitters, no chance to get away for a breather. Jaja runs his own business out of their home to support the foster children and be a present father-figure in their lives. Baba makes nearly all of the meals from scratch to ensure they are eating healthily. They are always busy, yet always find time do everything with the kids from playing games to teaching them table manners. Through her English-speaking son, Baba counted out on her fingers the difficulties of foster care that turn literally everyone else off to the idea. “You just need to have a heart.” Jaja interrupted in Polish, shaking his head at the thought that any reason would be an acceptable one for turning away innocent children. Yet in the region where Baba and Jaja live, comparable to a U.S. state, they are one of only two foster families. There is currently a waiting list eighteen children long to come and live with Baba and Jaja – all of whom are deemed too unstable to make it in an orphanage, but simply have no where else to go. The problem is staggering, but a few children at a time, Baba and Jaja are making a difference. The house is bursting with love and laughter and children that the rest of the world forgot, just like Baba dreamed. And it all started nineteen months ago. Baba and Jaja had officially become foster parents, a lifelong dream taking shape. They were ready for their first placement when the phone rang asking them if they would be interested in taking in a newborn baby. He was sick. He was small. His prognosis wasn’t good. They said yes, of course. This is what they signed up to do. And so, with grandbabies years older than this orphaned boy, Baba and Jaja took him in. From the start, things didn’t look good for the baby. They were told by the doctors that he was nameless at birth. Instead, the hospital had given him a nickname that openly displayed the sentiment they felt for what they considered to be an abandoned, sickly, unwanted child – a derogatory version of a Polish name, labeling him unmistakably as a second-rate child of poverty. Worthless of even a name of dignity. The doctors told Baba and Jaja that they were wasting their time. The baby was too sick, too malnourished. His head was much smaller than it should be, showing that his brain had not developed properly and never would. He would be a vegetable. He would never grow up, never have the mental or physical capability for anything. More than likely, he would not survive at all. They could take him, but only with the understanding that they would probably be taking him home to watch him die. If you knew Baba, it would not surprise you that she dismissed this opinion immediately. She was not in the watching-babies-die business, she was in the nursing-babies-back-to-health business, and she certainly was not going to give up on her very first foster child just because a hospital deemed him incapable of life, unworthy of a name. Baba decided then and there that this baby would be her special project. She took him home and gave him a new name and a new chance at life. 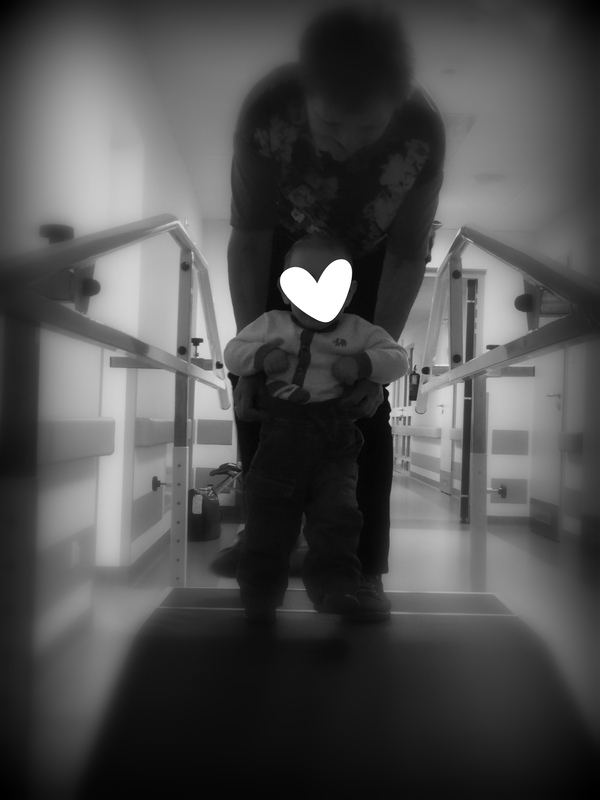 She began contacting every doctor and therapist she knew, and signed the infant up for every type of rehabilitation that would take him. Five days a week, she drove the 30 kilometers from her home in the village to the city for physical therapy, occupational therapy, speech therapy, massage therapy. Every couple months she would move with the baby into the hospital for 6-week long rehabilitation intensives. She showered him with love and attention and physical contact, demonstrating to him every day that there was nothing he couldn’t do, that he was worthy of a chance to live – even if no one outside her house thought so. And as the days and weeks and months went by, the baby grew. Like all babies, he learned to hold his head up and roll over and recognize the loving people around him. He became interested in eating and keeping food down, sleeping through the night and drinking in the world around him. 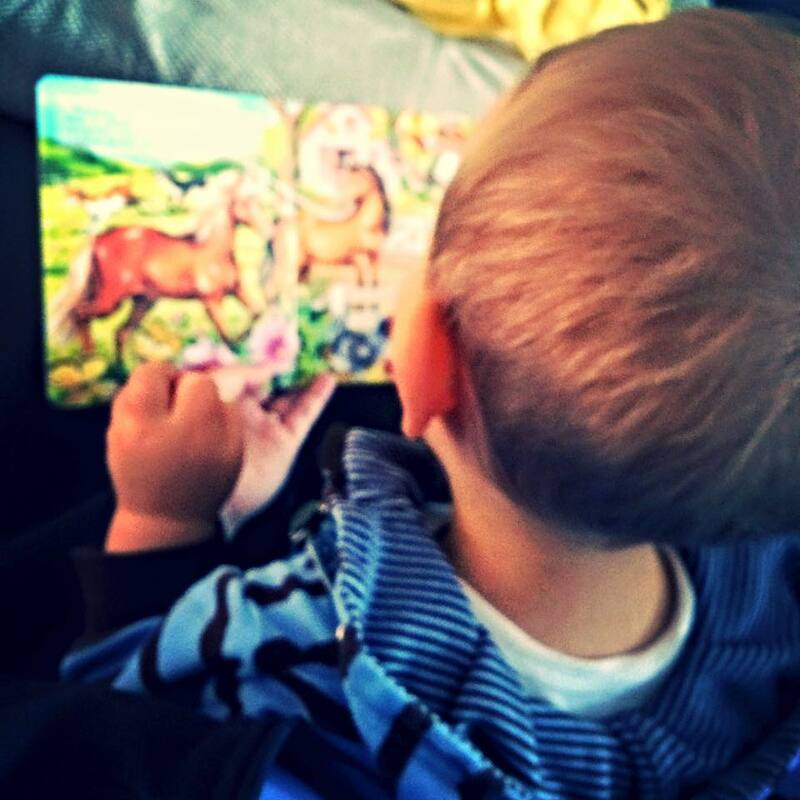 Baba read him books and took him on walks, constantly flooding his mind with new information. 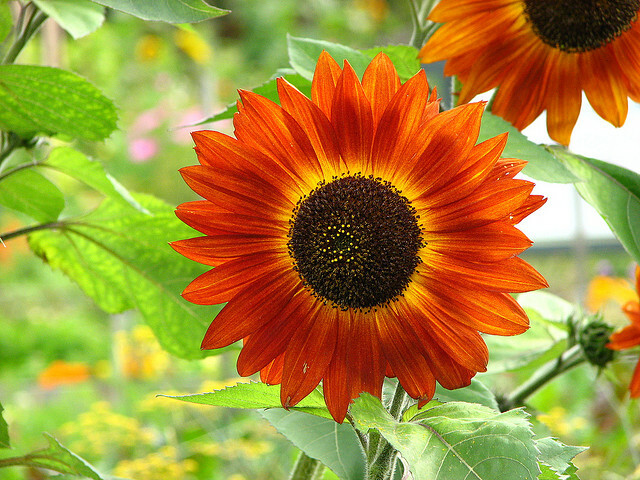 He was still very small for his age and reached milestones at a slower rate, but before Baba’s eyes and under her watchful care, he blossomed. At his next doctor’s appointment at the hospital, Baba insisted that the doctor come in and see him and measure his head, even though he felt it was a waste of time. When he finally came in, he was astonished. The baby’s head had grown by 10 centimeters. 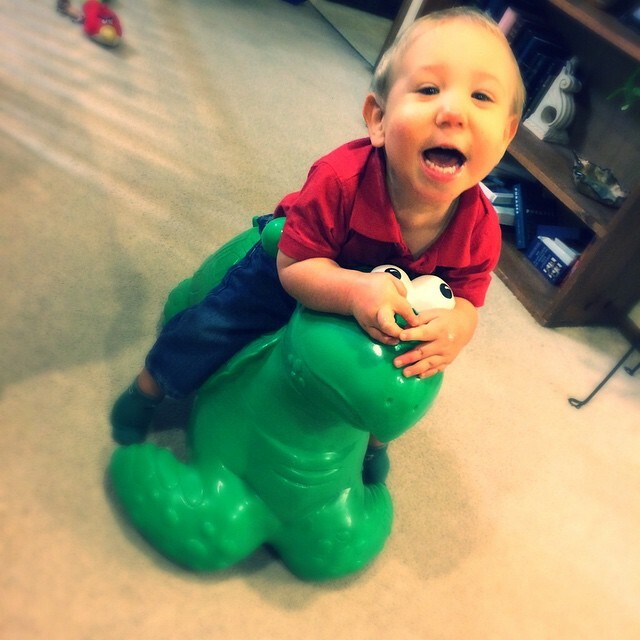 By the time he was a year old, the baby (now toddler) was not only still alive – he was thriving. His therapists estimated that he was just 3-4 months behind developmentally due to his slow start at birth, but was progressing normally. It was recommended to the adoption center that a family be found for him that could give him the same devoted care that Baba had tirelessly given him all those long, patient months. Many foster children came and went through Baba and Jaja’s home in the time this first baby had been with them, and it was time for him to move on to a family that could give him their sole attention. Baba had accomplished what she had set out to do. She had saved the baby’s life. 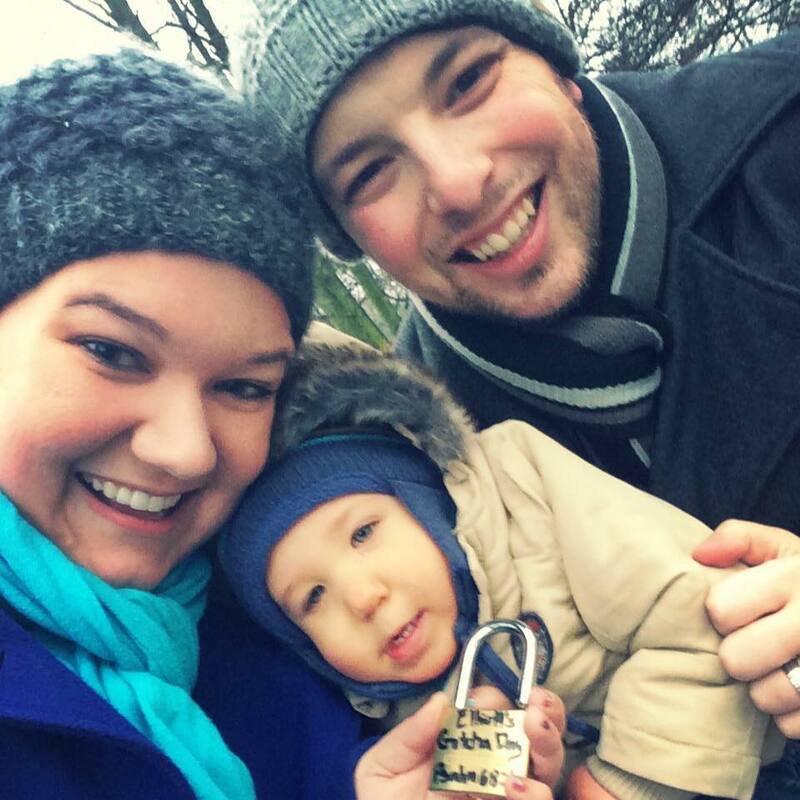 Little did she know, just weeks after the baby’s first birthday, days after he was deemed ready to be adopted, a couple was grieving a world away in Iowa. 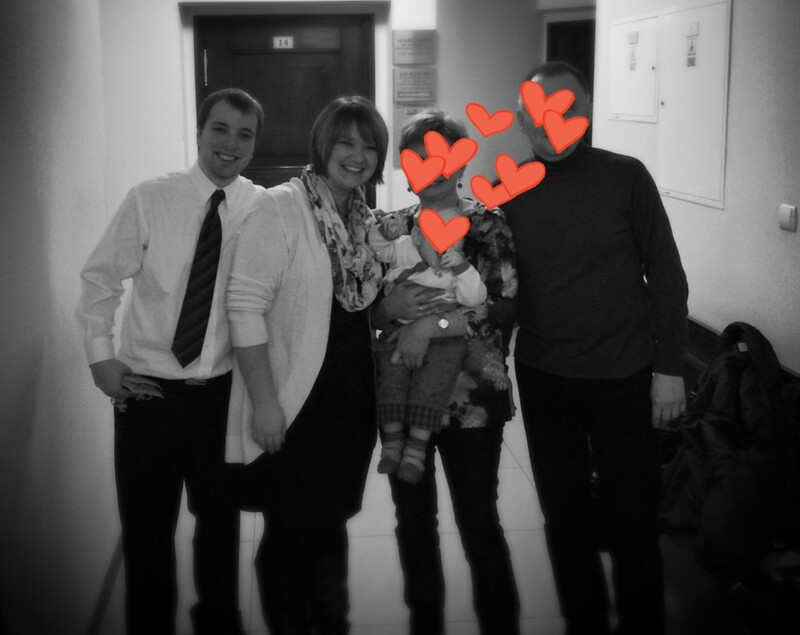 The child they had been matched with to adopt was no longer available, and their home and heart felt empty without a little boy to fill them. The very week that this couple was told they definitely would not be adopting the little boy they were waiting on, Baba’s baby was placed on a list of waiting children. The List is updated and given to adoption representatives only once a month. 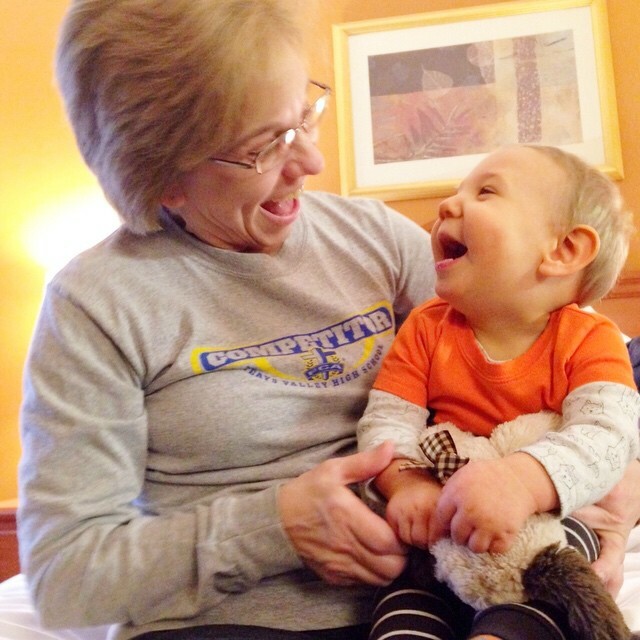 No local family was found for this sweet baby boy, as it is difficult for a culture that is skeptical of those with special needs to see the potential in a baby such as this, who had such a poor start in life. Baba and Jaja wondered if anyone else would see their precious first foster child the way they did, or if he would be doomed to a life “in the system”, deprived of the love and life they breathed into him. But not far away, an adoption attorney was sent The List that day. And that attorney was representing the grieving couple, who’s arms ached for a little boy to hold. A frantic, international call was placed to the United States. Pictures were emailed. Tears were shed. And just like that, only hours after being placed on The List, the thriving boy who was once sentenced to a brief, lonely life as an orphaned vegetable had a family. The the rest, as they say, is history. 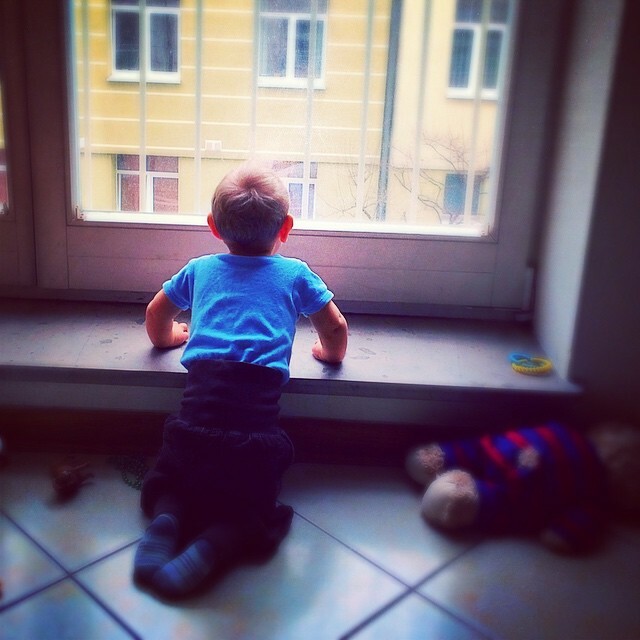 And now, sitting on the hardwood floors of our Poland apartment almost seven months exactly from that day we got the phone call, I felt the familiar joy and ache of watching this boy – my son – reach another milestone that he was never supposed to reach. Without a doubt, I know that with every milestone he reaches in his lifetime, I will send up a silent pray of thanks for God placing Elliott in Baba’s arms before he was placed in mine. Well, we have officially survived a full week of toddler parenting! Like any new parenting experiences, be it through adoption or birth, it has had its ups and downs, its victories and its defeats … but we made it! After our brief but emotional goodbye with Baba and Jaja, our life as a family of three began hardly before I had a chance to realize it was happening. Elliott and I arrived at the door of our fourth floor apartment, greeted by Alex, who was surprised to see that we were alone. This was it. We were on our own. Elliott had been to our apartment once before when we came to Wroclaw to go shopping with Baba, and we were glad that it wasn’t an entirely new place. The night before, we read in a book of ours about toddler adoption that toddler’s usually respond to the initial separation from their primary caregiver in one of two ways: by almost obsessively latching onto one of the new caregivers, or by acting completely ambivalent to the new caregivers. Each of these reflect a different manifestation of separation trauma. The former is the child’s attempt to prevent another loss of a significant figure, and the latter is a self-defense technique of avoiding getting close to another caregiver out of fear of another loss. Within minutes of arriving at our apartment, it was clear that Elliott was taking the first approach and completely latched on to me. For the first couple days, I could hardly put him down. He wanted me to either be holding him, carrying him, or interacting directly with him. When he woke up from a nap, he would sob hysterically unless I picked him up. He wouldn’t go to Alex, and wouldn’t allow Alex to comfort him. For our first day in the apartment, I couldn’t even leave him long enough to walk one room away to get a cup of coffee. If I was not within eyesight, he would melt down. It was tempting to see this as positive and affirming, especially after months of longing to have this little boy in my arms. And of course, it was a good sign that he was seeking me out specifically and finding comfort in my presence. Though, even in the midst of that, it broke my heart to know that the only reason he was acting in this way was not out of a particular deep affection for me, but out of sheer terror of losing yet another mother-figure. But as moment-to-moment survival turned into hour-to-hour, and slowly to day-to-day, the walls around his little heart started to come down. We started catching glimpses of the cheerful, charming boy we met months ago in videos and then in person just a couple weeks ago. He began sleeping through the entire night, and waking happy to see us rather than disappointed. 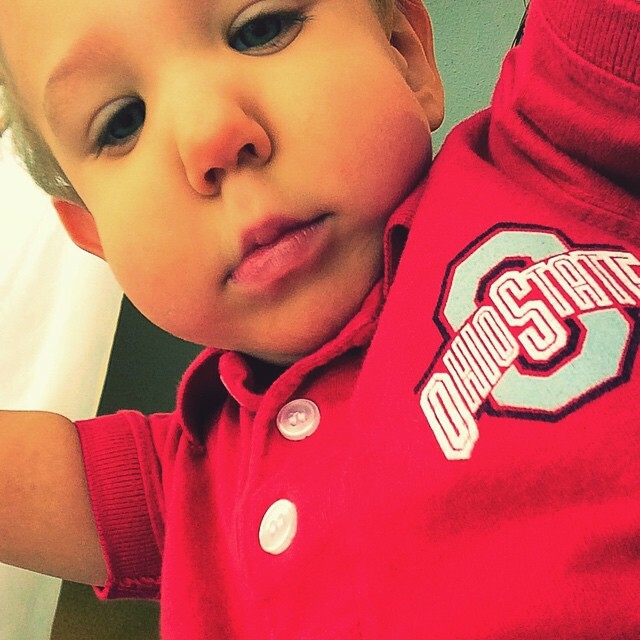 He started venturing out on his own in our apartment, exploring and getting into mischief like a normal toddler. He fell asleep peacefully without tossing and turning and whimpering in fear or frustration. 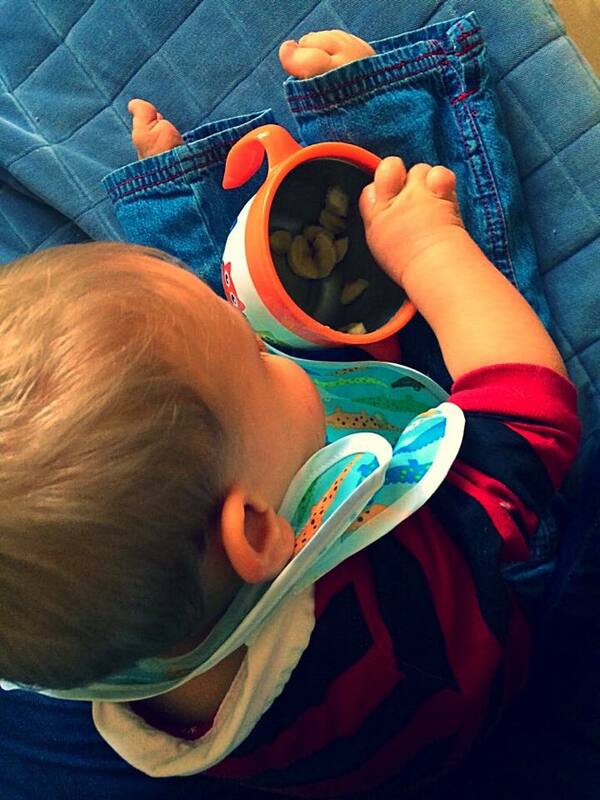 He began trying new things, like getting into his toy box, attempting crawling, and learning to feed himself. He sought out our praise. 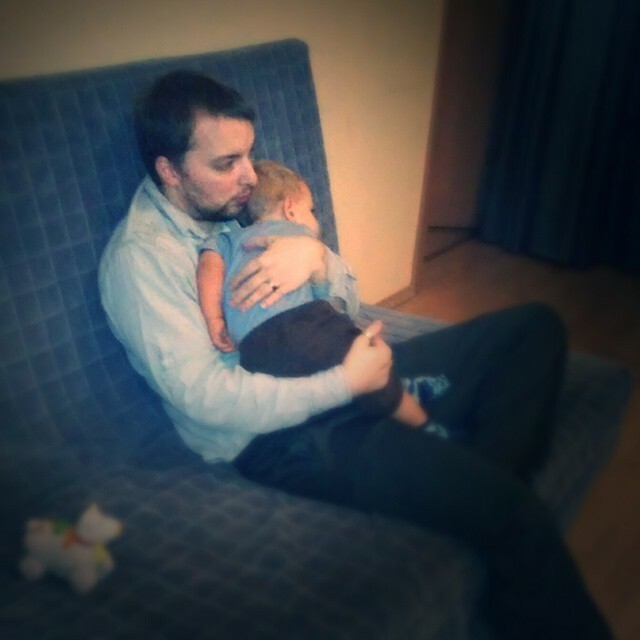 He let his Daddy comfort him. He began smiling and relaxing and making eye-contact. This doesn’t mean it has all been sunshine and roses. No matter how you spin it, Elliott is navigating a degree of stress, life change, and loss that would send most adults reeling. We still regularly have moments of soothing his curled-up body as he sobs in grief, temper tantrums when it is clear we are not the ones he wants, and instances of having him push us away when we try to comfort him as he communicates that he would rather be in his fear alone than risk connecting to a new person. In these moments, our job is not to correct inappropriate behavior, but just to be there. We stay close and soothe him however he will let us. We allow him to grieve. We give him space to be angry and frustrated and confused. We do our best to take none of it personally and show him that no matter what he does, we love him and we aren’t going anywhere. However he will listen, we tell him that he is safe with us and it is okay for him to trust us. It isn’t easy, but it is what he needs. Find what works, and keep doing that. As Alex put it, parenting is a an experimental in failure. Especially with a child that is unfamiliar to us, most of the time we are just guessing at what to do next or how to solve the moment’s problem. Does he lie still for a diaper change when he can play with the taggy blanket? Then keep it with the diapers. 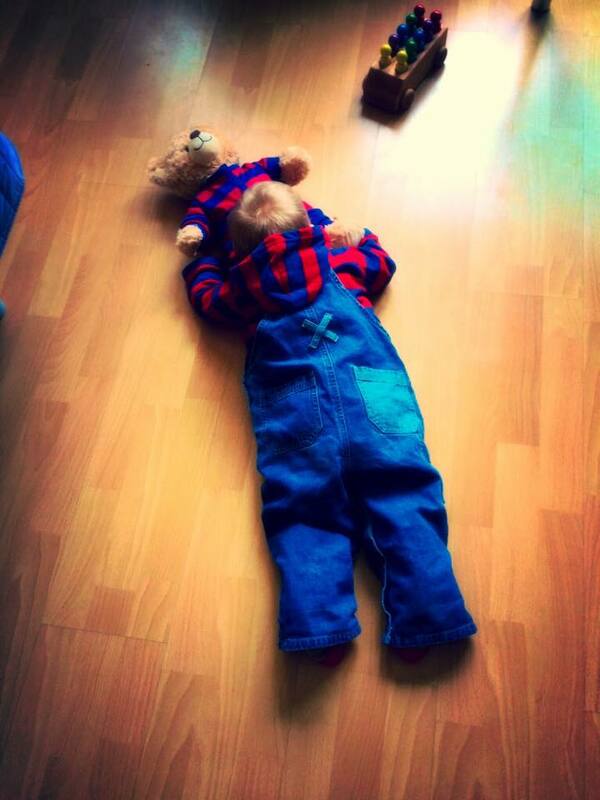 Can we trick him into a morning nap by letting him fall asleep on the floor watching Curious George? Then keep Netflix on standby. Will he calm down during therapy by playing with an animal app on my phone? Then pay the .99 cents. This stage is not about ideal parenting, it is about survival/attachment parenting. We do whatever we have to do to keep the dumpling happy and feeling safe and secure, even if it means we have to undo things later. When you find something that doesn’t work, move on. Don’t try and force it to work. This has been a particular challenge for me, as I already have engrained habits in caring for young kids and WHY DOES IT NOT WORK ON HIM?! I already know how to feed a child, put a child down for a nap, change a child’s diaper, etc. But I have never cared for a child that is in the midst of trauma and grief, and it is just a whole other ball game. Most everything I thought I knew about caring for young children has had to be thrown out the window, and I have had to force myself to unlearn habits. Trying to force Elliott into behaving like a “normal” child and my “normal” ways of care just makes us all frustrated. Oddly enough, this has made parenting easier for Alex, who doesn’t have much experience with caring for young kids. What works for everyone else might not work for your child, and that is okay. Parenting an adoptive child is just a whole different type of parenting, plain and simple (see above). We knew this would be the case, but nothing can quite prepare you for the actual experience. Even among adopted kids, every child has a unique experience and unique challenges to attachment, so you really are mostly on your own … and that is okay. The friendly advice your family or friends give you probably won’t translate to your adopted child, so don’t be disappointed or confused when it doesn’t work. Don’t get hung up on all those by-age developmental milestone things. I think this is would be important even if I had a biological child, but it is an especially important reminder for parenting an adopted child, particularly one who has had developmental delays since birth. Kids who grow up in their biologically family just develop quicker – they have parents or older siblings giving consistent attention and who introduce new learning experiences all the time. Orphans who have experienced orphanage life or transitional foster care have brains that are focused on survival and just don’t have energy left over for development (I believe that is the technical, scientific explanation. Obviously.) The best thing we can do is keep tunnel vision on Elliott alone, celebrating his improvements and encouraging him in ways to grow and develop. Divide up responsibilities to play to your strengths, but don’t keep score. In the beginning, we tried to take turns on EVERYTHING. Diapers, feedings, getting him to sleep, playtime, therapy practice, baths, bottles, etc. We did this partially because we wanted Elliott to have exposure to both of us, and partially because we thought it would help our sanity. It didn’t. Turns out, we are each just better at different things (or, at the very least, Elliott responds better to us on different things). For whatever reason, Elliott will only fall asleep easily for me, and will only eat without spitting food everywhere for Alex. Turns out he is happiest with Alex for bath time, but will work on therapy homework better with me. In order to keep the happy/secure levels high, Alex does all the baths and feedings, and I do all the bedtimes and therapizing. We stopped taking turns on everything else (like diapers, for example), and each just deal with whatever comes up in the moment. So far, it is working! Take breaks. For the love, take breaks! We do this in a couple ways. In the mornings, we each take shifts of playing with Elliott so the other can have some quiet time to shower, get dressed, take a breather, etc. Weather permitting, we also try to take about one family outing a day, just to get out of the apartment and do fun things together. Beyond that, we try to each get out of the apartment individually every day. One of us will run out to pick up some take-out for lunch, the other will go out later for diapers. The outings are short, but they give us each a bit of alone time and fresh air. Ignore bad behavior, reward good behavior. 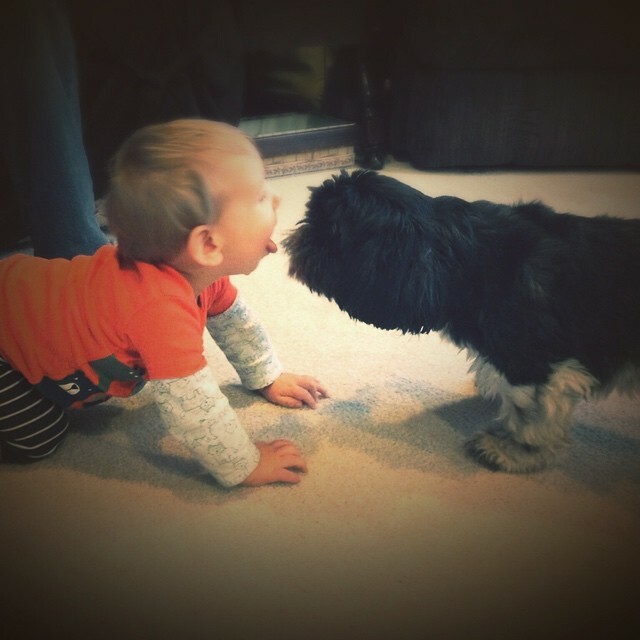 This might not work for every kid, but Elliott is an attention-seeker. Pretty much everything he does, good or bad, is to get a reaction. We learned pretty quickly that the most effective way to influence his behavior is through our attention (or lack of it). Do we want him to quit spitting food? Then we just walk away from him every time he does and come back when he stops. Worked like a charm. 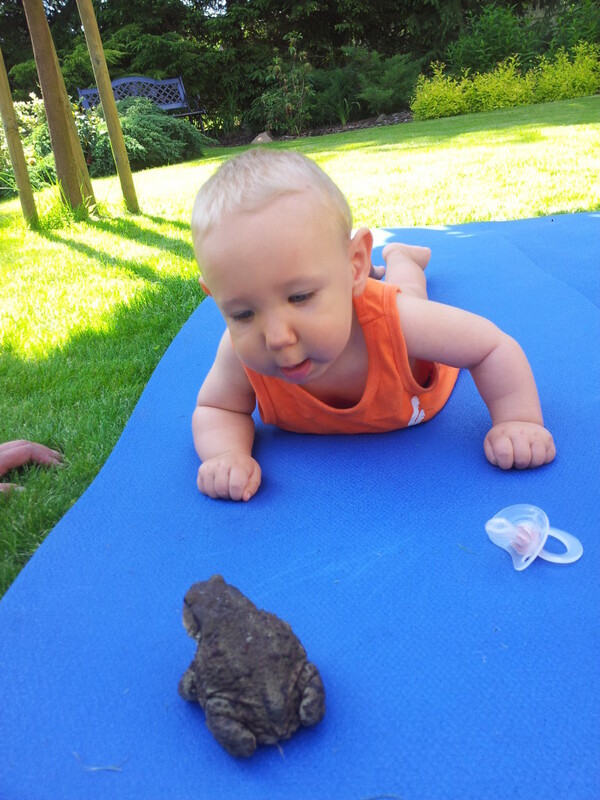 Do we want to encourage him to crawl? Then we make a HUGE deal over even the tiniest attempt, and soon he is trying to crawl his little heart out. This approach is also a huge asset to attachment, because it is reward-based rather than punishment-based. Find your own special way to work on attachment. It took us each some time to figure out our own ways to bond with Elliott. He has his own likes/dislikes just like us, so the key has been matching up what I like with what he likes, and what Alex likes with what he likes, and using that to bond. That way, we each have our own special way to spend time with him. For me, that is in a lot of face-to-face time. 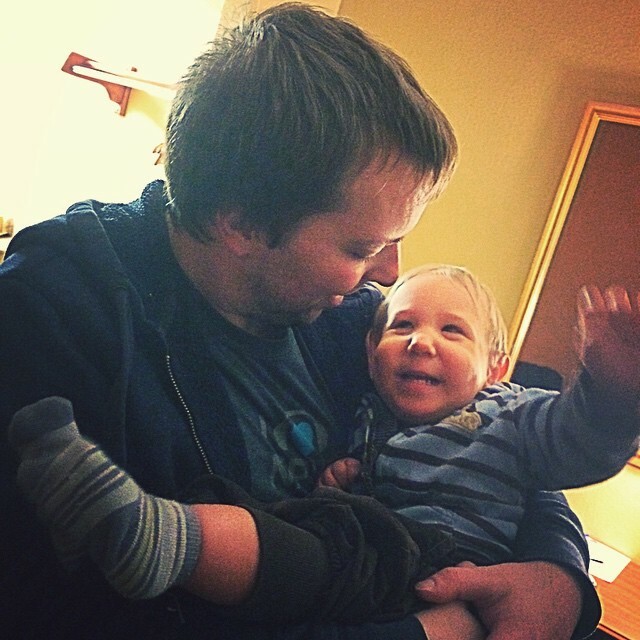 Elliott loves feeling my cheeks, ears, nose, etc., and having me mimic him. Because of that, we spend hours making up silly little games that involve being face-to-face. For Alex, that is rough-housing. He carries Elliott around by his feet, tosses him onto the bed, throws him into the air, douses him with water in the tub. Those two. It all terrifies me, but Elliott LOVES it. Set your expectations as low as possible. Better yet, don’t have any at all. No matter how good one day goes, the next day could be one long battle. For the most part, we go to bed when Elliott does, because we never know when we will have another no-sleep night. We plan our outings to be short, because the smallest thing might trigger a meltdown. We stay as relaxed as we can, while always being prepared for the worst. We celebrate successes, milestones, and small victories, but we don’t expect them. Adoptive parenting (at least in this stage) is very reactionary. As I said, our #1 job right now is to make Elliott feel as happy, safe, and secure as possible. 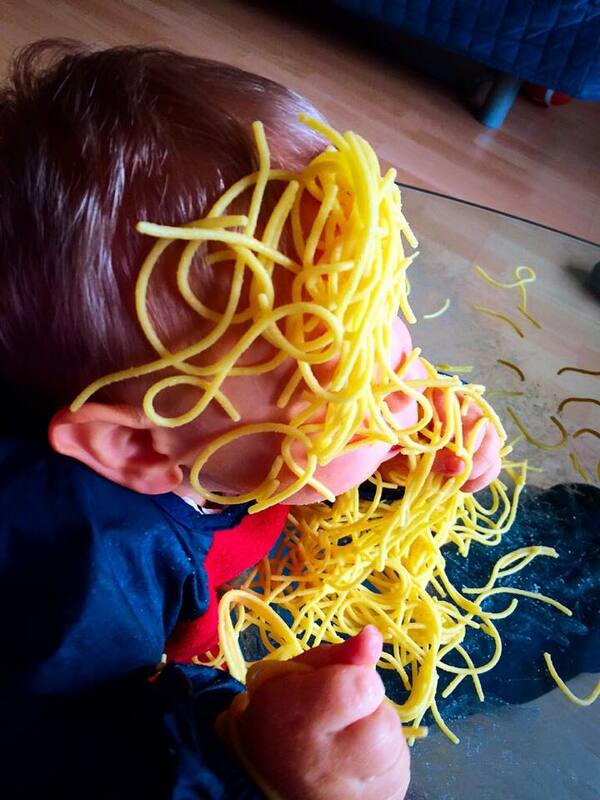 This means that our style of parenting probably looks a little foreign. It involves a lot of spoiling, little rules, and many exceptions to the few guidelines we do have. It means that while we do spend focused time encouraging his development, in general we treat him like you would treat a newborn. We rock him, carry him, baby him, snuggle him, hand-feed him, bottle-feed him, and talk to him as if he was a baby. We let him lead every interaction, and respond/react accordingly. Going to sleep is one of the most poignant examples of this. On a day that he is feeling safe and secure, he might want to fall asleep in his usual way, by just being laid down and left in the bedroom. On a day when he is feeling scared, he may want me to rock him to sleep, or just simply sit in the room until he falls asleep. At this point in his grieving process and our attachment process, his feelings of security/security/sadness and change moment to moment. Our job is simply to react to however he is feeling until he feels secure/safe/happy again, even if that means abandoning most typical parenting practices. There will be time for that later. This was our plan going in, and our recent visit with a child psychologist from the court said this is the best possible thing we could do for him. And so, we carry on! Every day, we learn something new. Slowly but surely, we are becoming a family and learning how to do this crazy thing called parenting. FYI: We will post on here when we can, but for daily updates and pictures, follow us on our Facebook page.